Scroll down to see the journal of KC0QWE. Latest entries are at the top. Comments and advice are welcome! Haven't done much lately, besides keeping the antenna guylines tight. 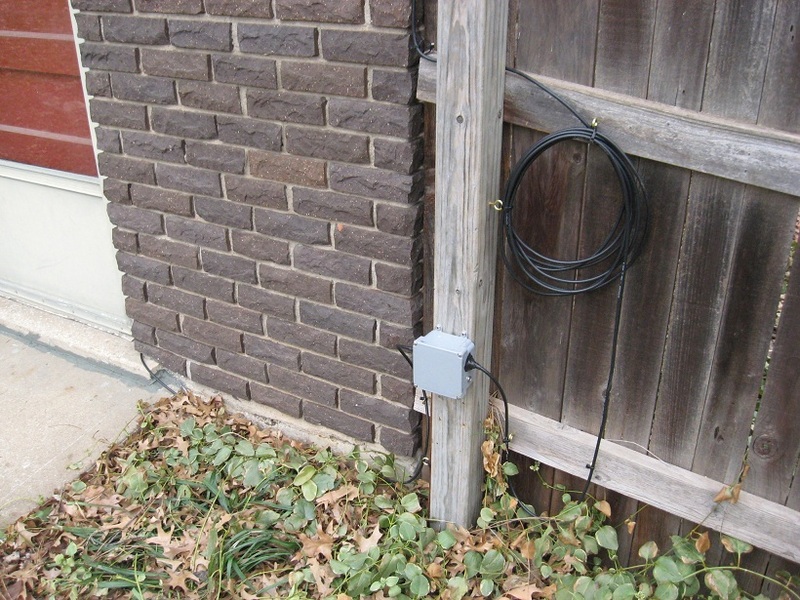 They're made of woven fishing line, and are invisible in these photos of my inverted v.
Just finished installing an Alpha-Delta ATT3G50UHP Transi-Trap lightning surge protector. 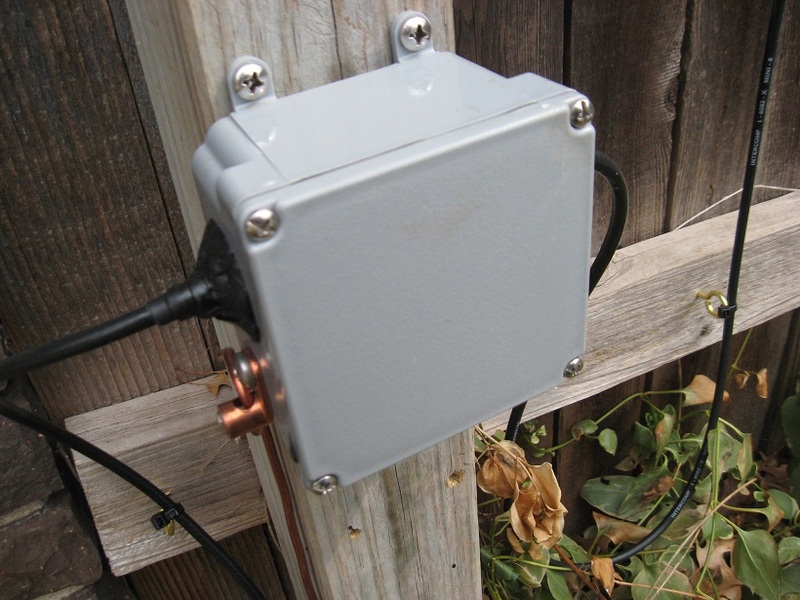 The antenna signal passes via coax through the device, which is mounted on a copper plate in a waterproof box. I made the holes in the grey box large enough to get coax connectors through, and they're sealed with Coax Seal. There is a heavy lug bolted to the plate, to which I've connected #6 awg solid copper wire. 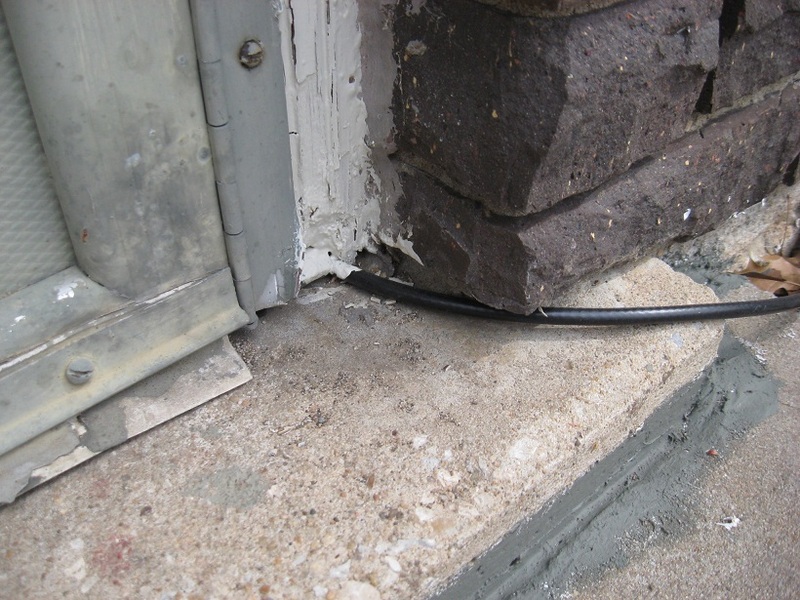 That runs across a 4-foot concrete slab, behind a bead of caulk, then underground, protected by 20' of grey PVC, to the house grounding post. 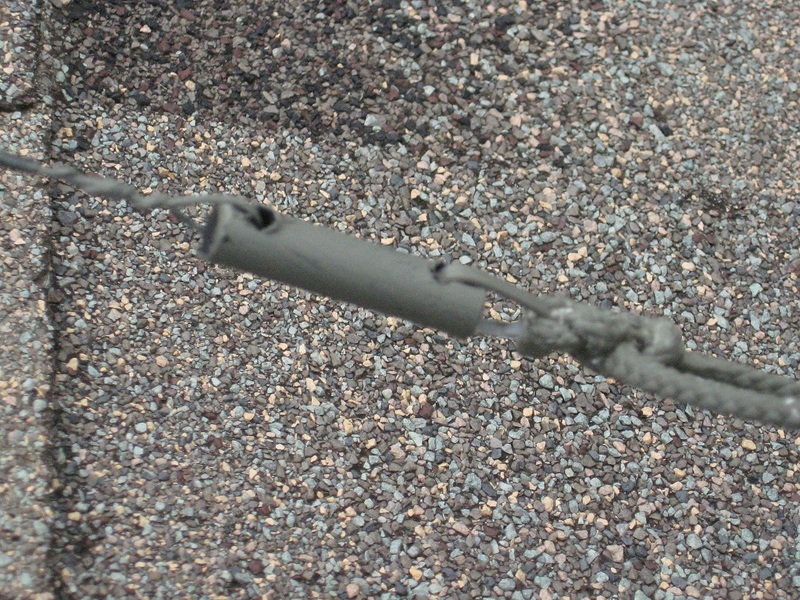 I used a split-bolt connector just before the wire enters the soil, to bring the ground into the shack, and it runs up and across the table behind my rig. 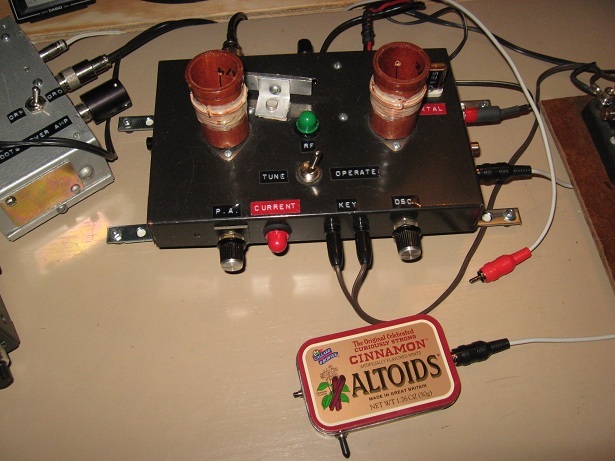 Transmitter and receiver grounds are connected to it via a heavy copper ground bar. 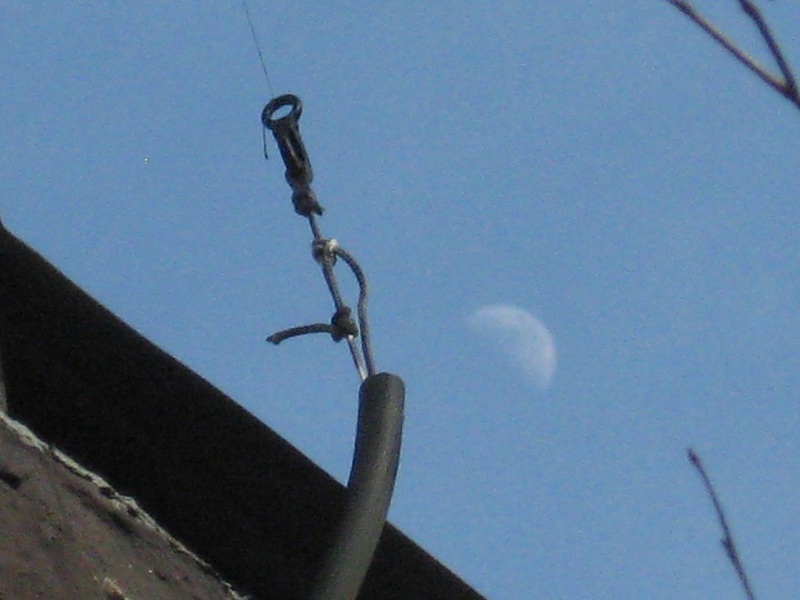 My inverted V antenna's center is 36 feet up. 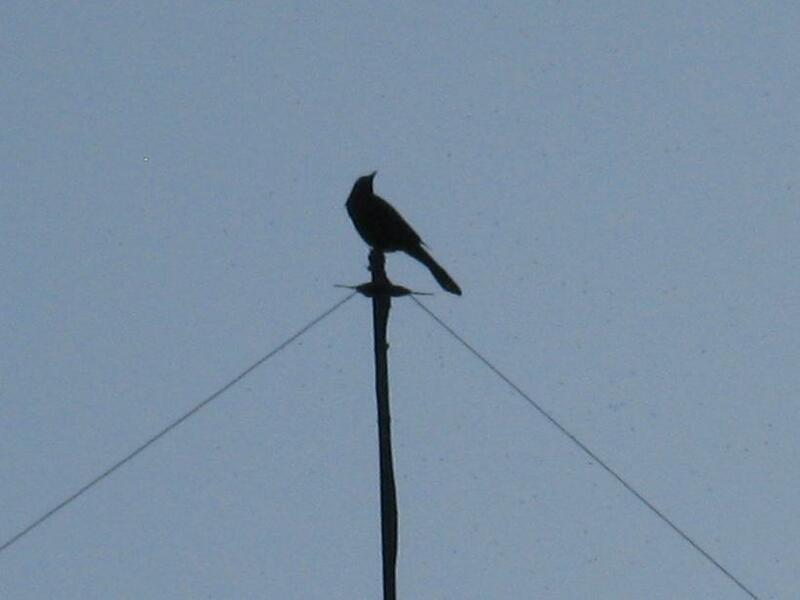 The mast extends about 16 feet above the top of the chimney, and is guyed with 50 pound test fishing line. 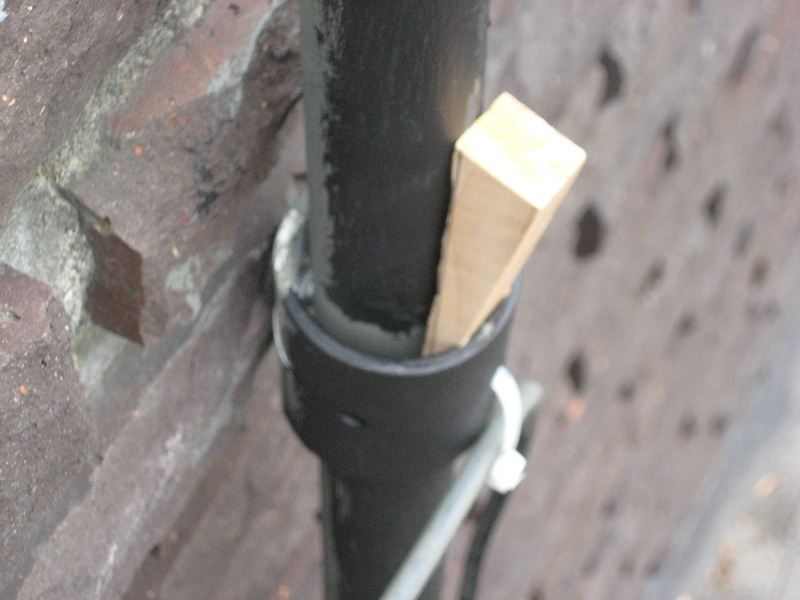 The lines are secured with arbor knots to brass spring clips. I'm working on WAS using only 40 meters and CW. 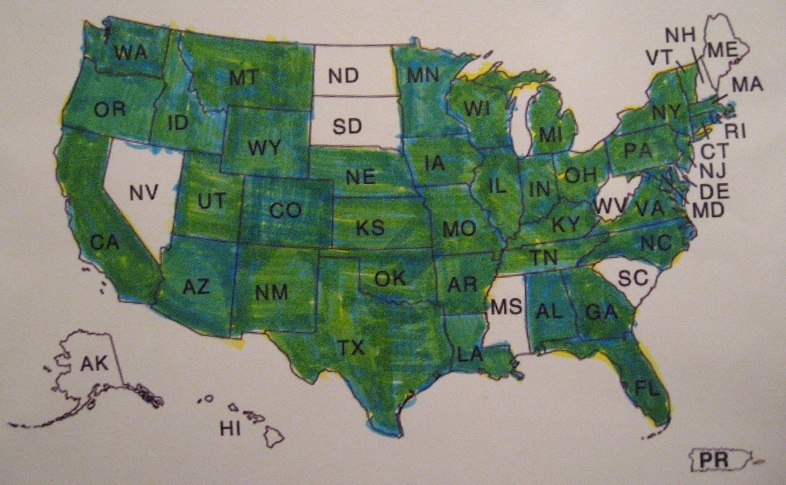 I have 11 states left to go. 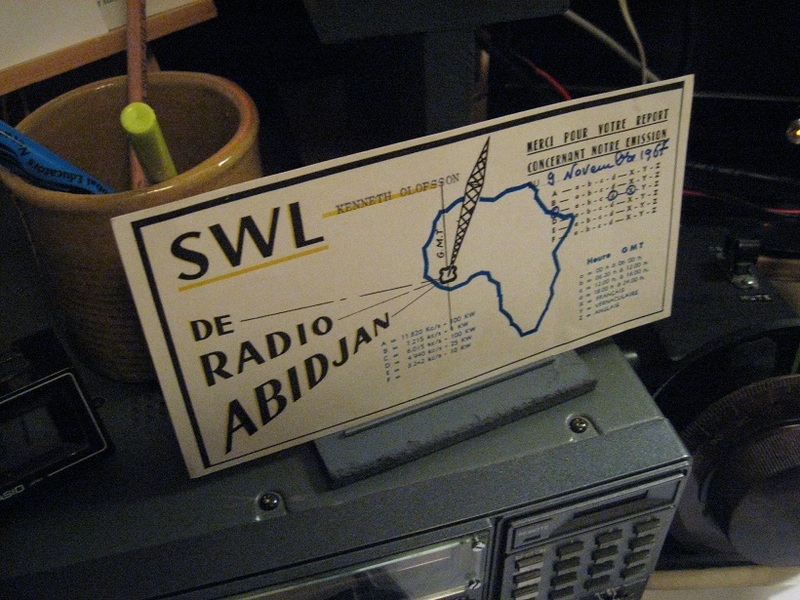 One of the things that first got me into SWL in 1976 was seeing the magical and mysterious design of the Radio Abidjan QSL card in a book. I have a few African SWL QSOs, but I didn't earn this one. I recently won it in an eBay auction. My SWL habit of patiently searching and listening through oceans of noise on the Tropical Bands is now paying off as I hunt down weak CW on 40 meters. Recently removed the keyer junction box, replacing it with an insulated jack on the transmitter parallelling the key input. I simply connect the keyer to the transmitter as before, and run a cable between the new jack and Miniboots' keyed 12v input. Had my first non-USA QSO: OK1AWZ in the Czech Republic. Got a 583 report on 12-15-2012 from W7ARG in Idaho. I retuned the transmitter and the problem went away. 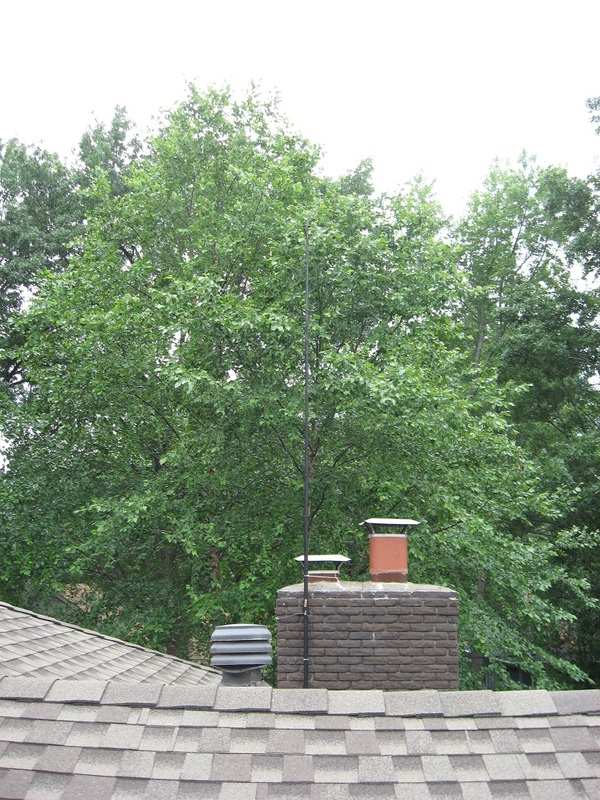 After I raised the antenna, I began receiving 7 for tone on RST reports, and I had a couple of comments about hum. The tone out of the receiver when actually transmitting always sounded bad to me, but I usually received 9 for tone. 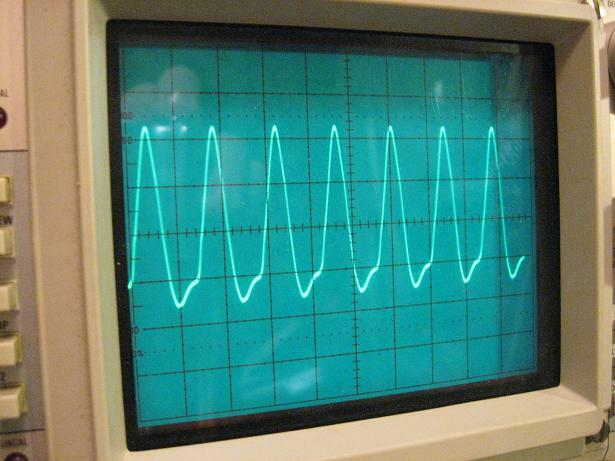 The tone into a dummy load sounded fine to my ears, and the waveform looked good on the scope. I guessed that when I raised the antenna, I somehow loosened the center connector. I got up there and lowered the mast, took off the Coax Seal, and cleaned the connection with Caig De-Oxit (although it looked completely clean, it may have been a bit loose). I reassembled and sealed it with Rescue Tape and Coax Seal. I'm getting 9s again. I also recently removed the "balun" and put brass spring clips on the guy lines, tied with arbor knots. 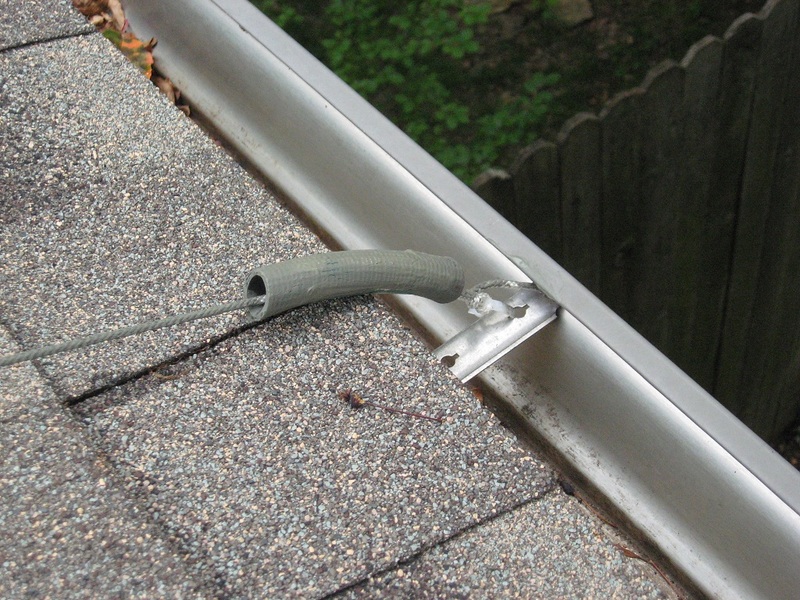 These clips attach to nylon cord loops on the mast and at anchoring points on the chimney and roof. This makes antenna maintenance a lot easier. 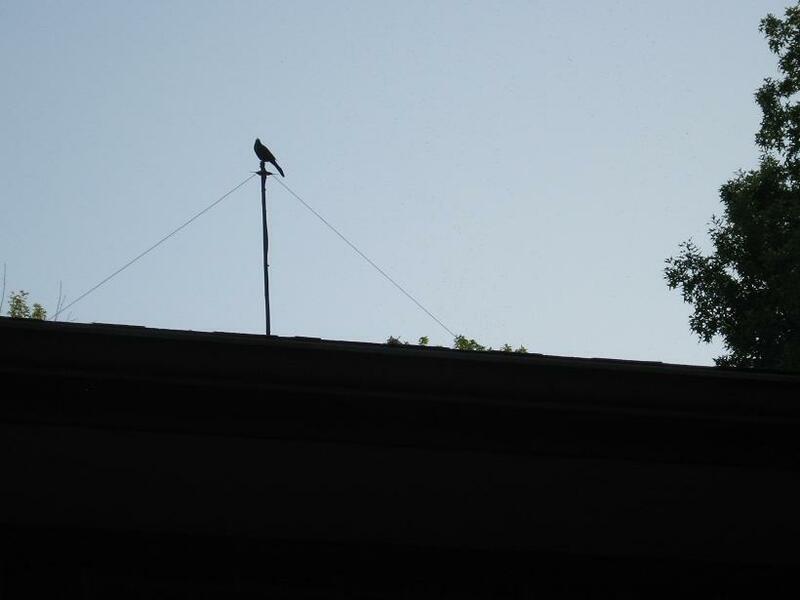 I made a mast extension from an 8-foot bamboo pole attached to an 18" sleeve of PVC to couple it to the existing mast. This increased the inverted v's height to 36 feet at the center. I added two guy lines made from woven 50 pound test fishing line, and they keep the mast straight and stable. 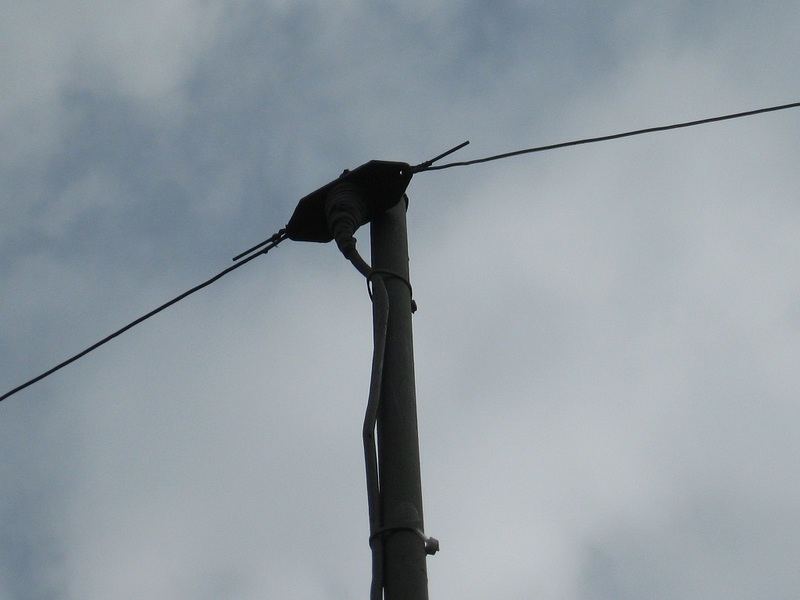 In a moment of mental blackout, I put a tight 3-turn coil in the feedline right at the feedpoint of the antenna. I should have read up on baluns first. It's probably just doing nothing, and I will remove it soon. There are a few noticeable differences in reception now. There is more atmospheric noise, there is more audible activity below 7.010 MHz, I hear more pileups, and everything seems louder. 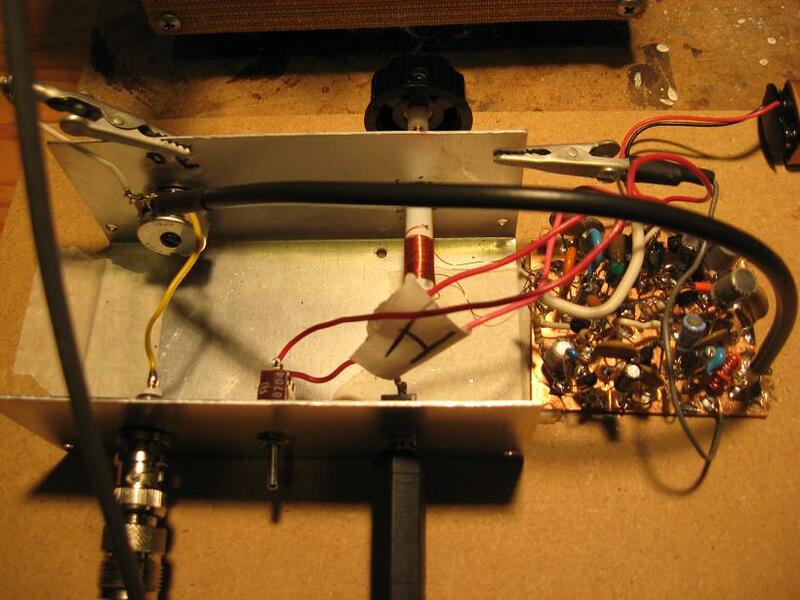 I find myself using the receiver's attenuator switch more than before. 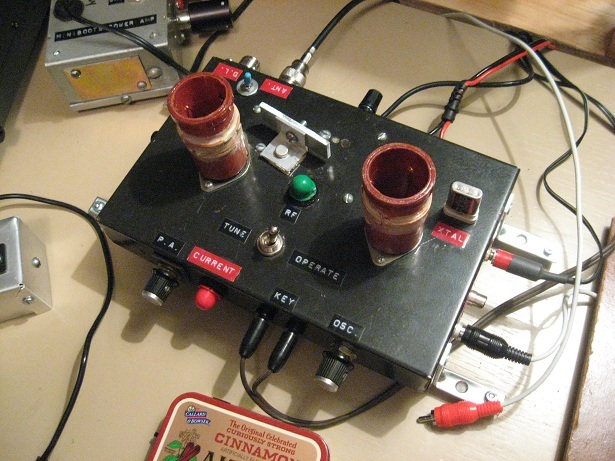 I haven't tried transmitting, but I retuned the transmitter on an empty frequency. The readings I get with the noise bridge seem to be slightly better. Shortened the antenna by about 8" on both sides. 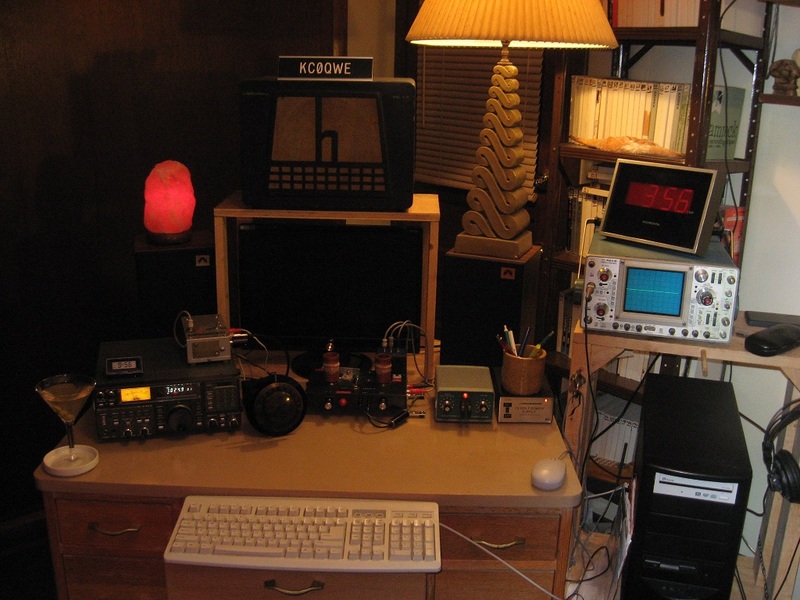 The resulting resonant frequency was 6.920 MHz, up from 6.745. I'm trying to get it at 7.025. Retuned the transmitter. Shortened the antenna again, by about 4.5" on both sides. Removed the plastic coathanger material insulators (after accidentally melting one of them) and just attached the ends of the antenna with cable ties. It will make no difference. Also removed the fishing line I was using, because it's too hard to adjust after it's tied. Replaced it with my old standby woven polyester/nylon cord. Now I don't get a distinct null, but I determined the resonance by splitting the difference between the lowest and highest frequencies where I hear an increase in noise, and it turned out to be around 7.010, which will be good enough for now. Retuned the transmitter. My PTO/VFO was a bit wobbly on its 3 points of contact with the desk, so I attached a masonite rectangle to those points with black silicone gasket sealant, and covered the bottom with nonskid rubber material. The device stays put now, and takes up no more space than before. It's bulky, but I can zip to anywhere within the VFO's range very fast by spinning the massive 1920s bakelite dial. Replaced a 7410 IC in the keyer. Now the hold button works as it should. And I tightened the play and loosened the tension on the paddles. Big improvement. 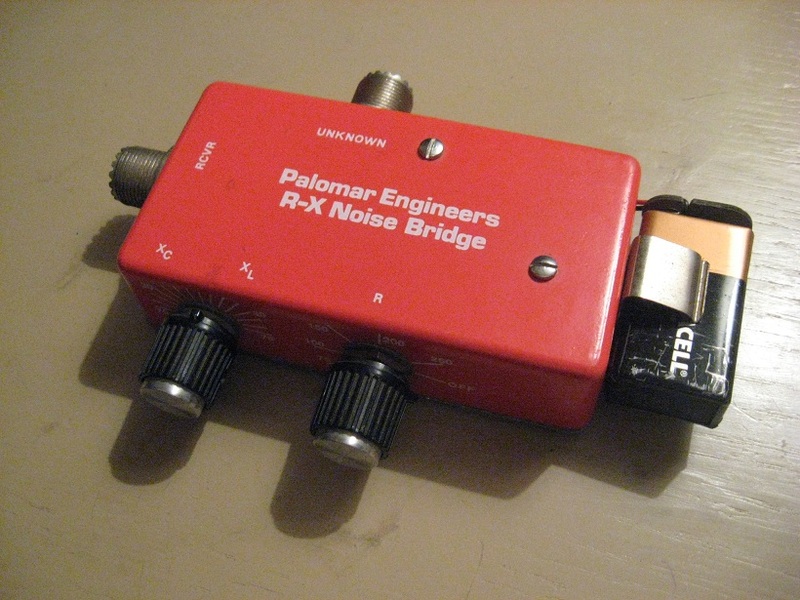 Got a Palomar R-X Noise Bridge on eBay for just under $50 shipped. I built a similar device from some plans I found online a few weeks ago, but it didn't work for me and I don't have the patience to debug it. This one works fine. It told me that my antenna needs to be shortened; it's resonating at around 6.745 MHz. 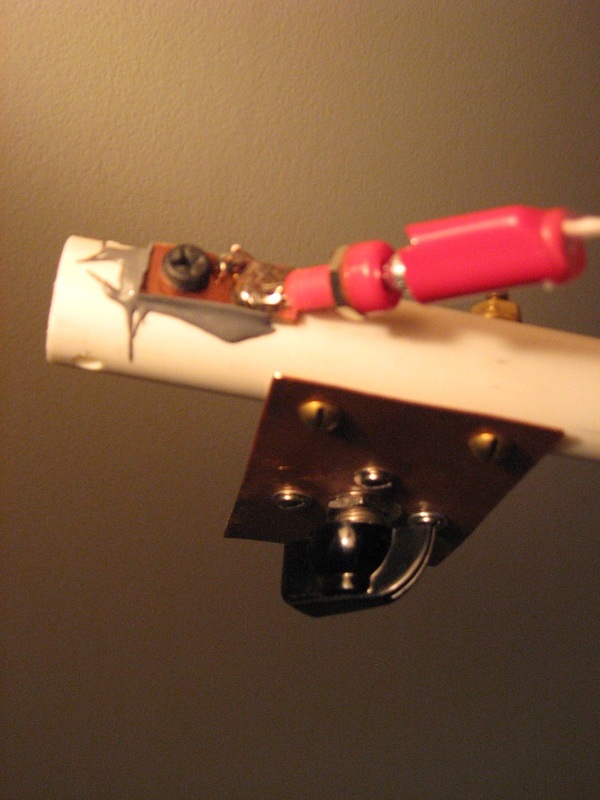 I originally cut the antenna for 7.110 MHz, but now I'll be shooting for 7.025 MHz. It may have changed its resonant frequency since I changed it from a straight dipole to an inverted V.
I finally got around to adding a padder to Miniboots. 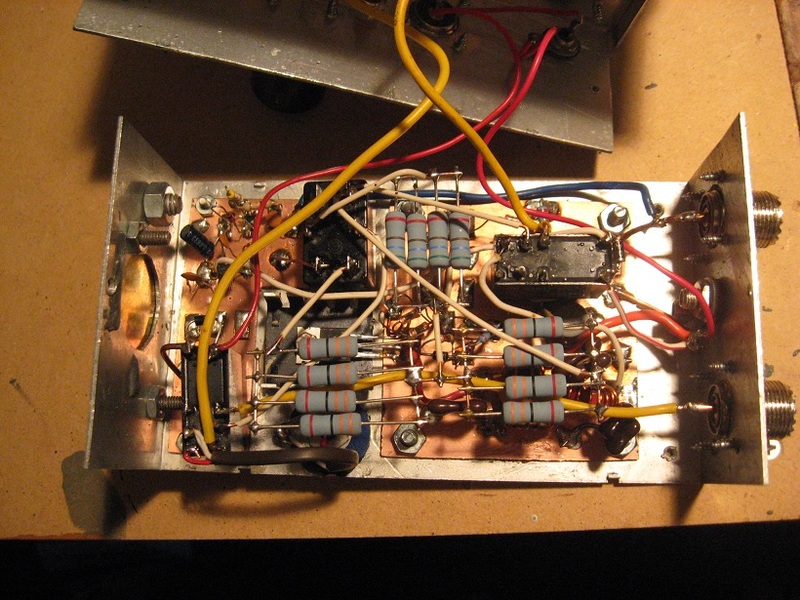 The QRO output is currently about 7 watts. With the padder, I can switch between that and 3.5 watts, in case I want to be truly QRP. 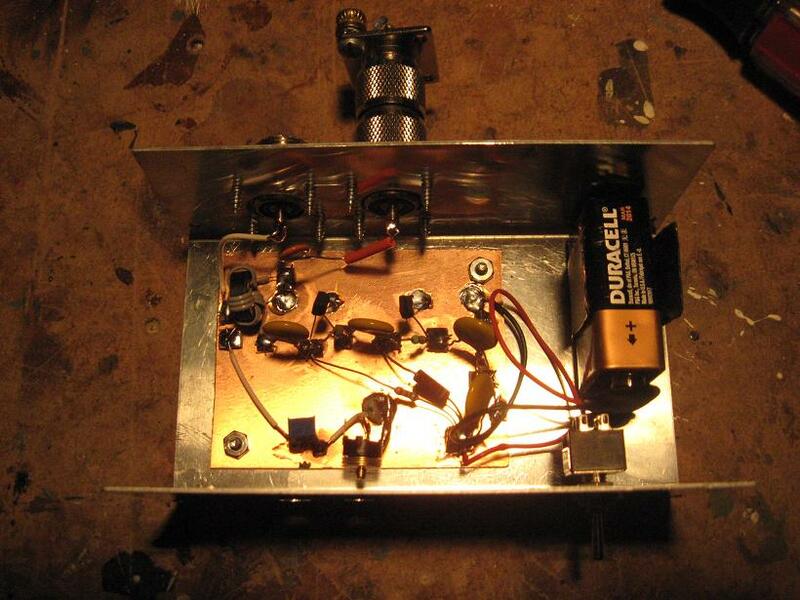 I built it from 2 watt resistors. My first attempt failed, and then I realized that I hadn't switched the pad's ground in and out. I feel lucky that I didn't fry something. I got the idea from The Milliwatt, Vol. 1 No. 1, 1970, available on CD in PDF format. I also have a couple of new shack additions. I found a 5 pound weight at a garage sale. 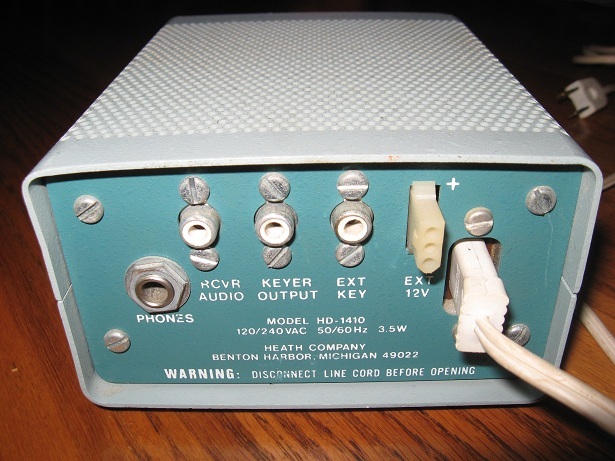 Perfect for the Heathkit HD-1410 Electronic Keyer. Now, although the paddles still feel sloppy, the enclosure isn't going anywhere. I also decided that Miniboots was just too close to the receiver, so I built a riser for it. Now it's a few inches above the receiver. Not sure if it helps anything, though. 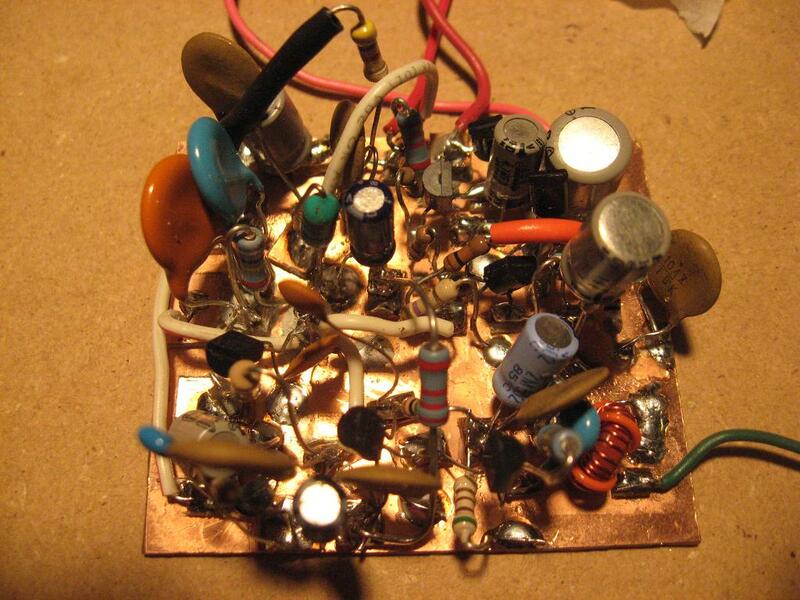 I built the New England QRP Club Noise Bridge Project. It "nulls" per the instruction manual, but I haven't figured out how to use it. More trial and error is needed. I drilled two holes in the enclosure, hoping to be able to adjust the trimmers through the holes, but it's almost impossible. I might have to do some rebuilding to get the trimmers sitting right at the holes instead of half an inch back. As on TinEar, I made a battery holder out of a small piece of sheet copper bent in a U shape, siliconed to the bottom of the enclosure, and coated on the inside with liquid electrical tape to keep the battery from sliding. 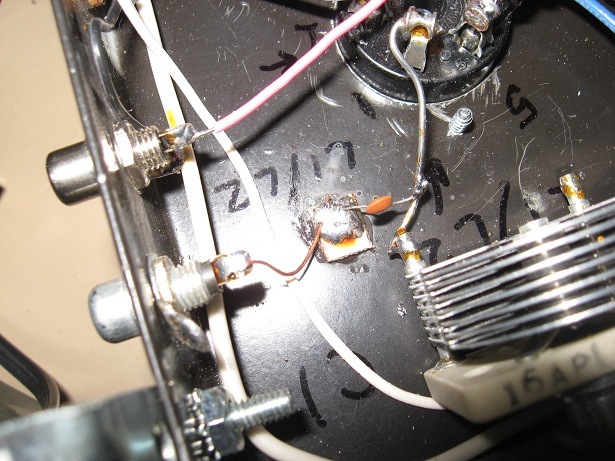 I fixed a hum problem in my Icom IC-R71A receiver by replacing the bridge rectifier (KBPC102) on the regulator module and reflowing a few connections on the module board for good measure. It was somewhat tough to remove the module, but well worth it. On the air again, finally. First QSO since 2004: KB6OIN in St. Helena, CA. My RST: 529. Better than I expected for readability and tone. His RST: 449. The massive dial on the PTO/VFO makes it easy to quickly put the transmit frequency right where I need it. I added blobs of liquid electrical tape to the bottom edges of the PTO/VFO assembly to keep it from sliding, and now it's solid. I need to practice sending with the keyer. I've never used anything but a straight key until now, and I made lots of errors with the paddles. I'm not going to be logging any more QSOs here, but this one means quite a bit to me. 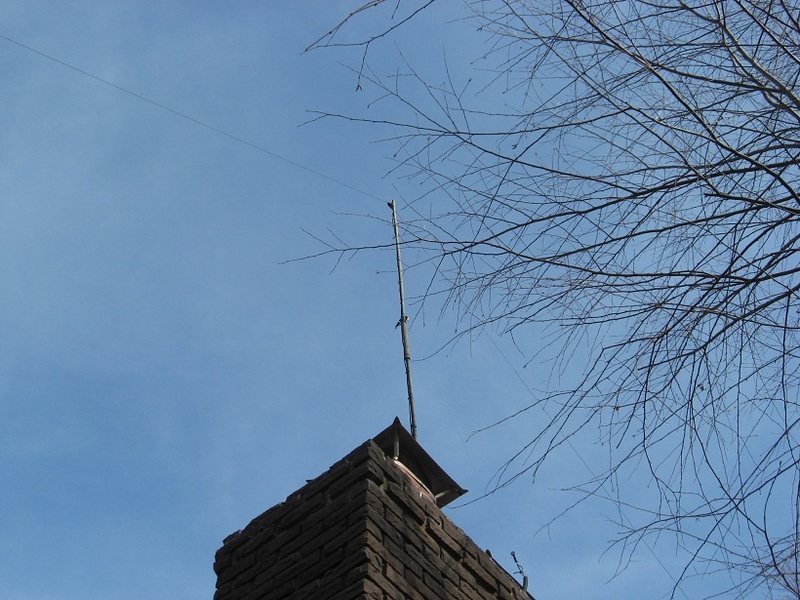 My main antenna is now an inverted V up 28 feet at the center. 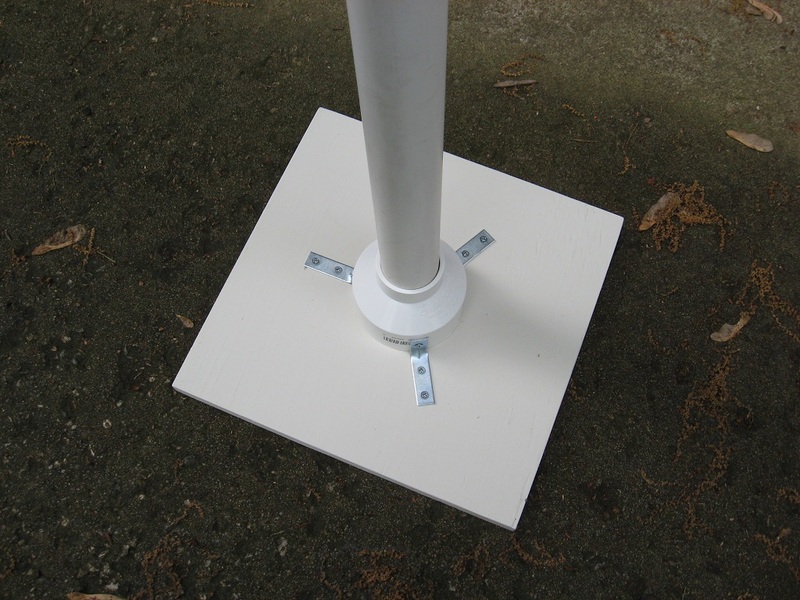 The mast is made of 10 feet of 1" PVC topped with an 8-foot 2-part aluminum painter's extension pole. The three sections are bolted together, with enough overlap to keep the mast rigid. I mounted it on the chimney and painted it flat black on the street side and olive drab on the other. 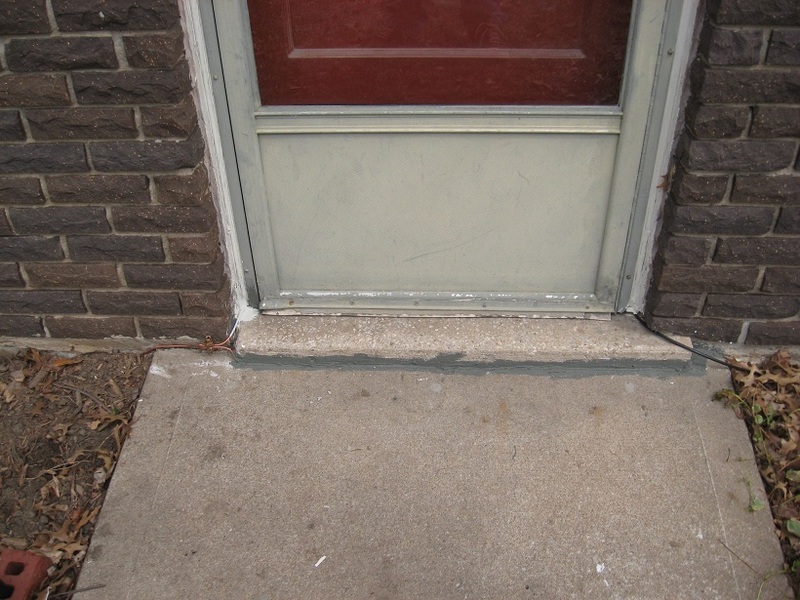 A cedar wedge keeps it secure in its mountings (PVC couplings one size larger). 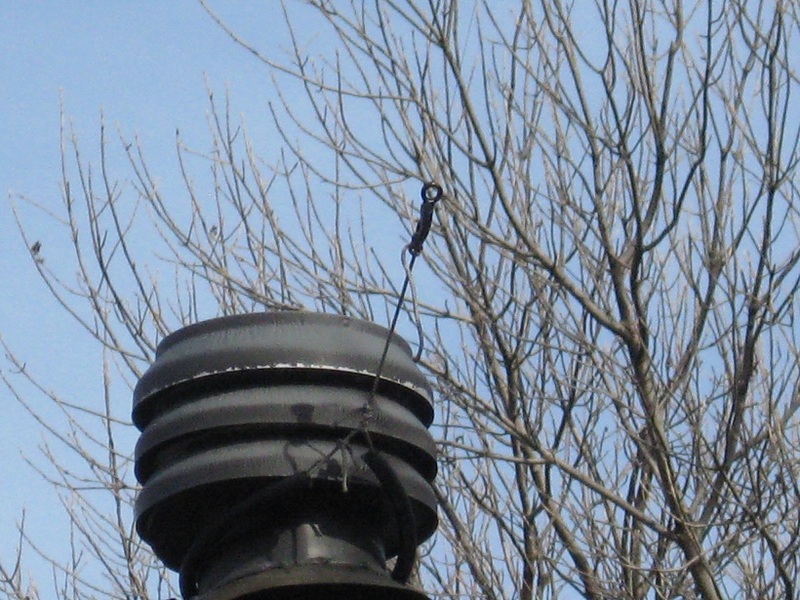 A nylon cord around the flue keeps it straight. It only sways 2-3 inches at the top in a brisk wind. The excess feedline provides slack for disassembly. The mast is nearly invisible from the street. Reinstalled the original variable cap (on the left in the photo). I had connected it incorrectly. Behavior seems to be about the same as the dual-ganged cap, but there are no rotation stops in the original. I dipped the TinEar tuning screw in plumber's grease, then screwed it back in and wiped off the excess. Much smoother tuning action now, and the screw doesn't rattle around anymore. A few days ago, I modified the battery clip inside the TinEar. I had made a simple u-shaped clip from a piece of sheet copper, and secured it inside the enclosure with black silicone. The battery wouldn't stay in the clip, because the copper wouldn't maintain enough tension. I coated the inside surface of the clip with liquid electrical tape, which formed a rubbery non-slip finish when it dried. Problem solved. Finally understanding the variable cap issues. Till tonight I never really understood where to connect one end of the loop to the rotor. Steve Smith WB6TNL informed me that I had inadvertently created a 'split stator' variable cap arrangement by connecting each end of the loop to a separate stator connection in the latest variable cap I've been using, instead of connecting one end to a rotor and one end to a stator. Tonight I mounted a lug strip on the crossbar, soldered the loop ends to two of the lugs, and soldered short leads with alligator clips to those lugs. This makes it easier to try out different caps. The result of some trial and error testing: The needed capacitance is lower than I expected. I tried 50, 33, 36, 5, and 3 pf non-variable values. There was dead silence on all but the last two values. A 5 pf ceramic cap gave the best results, but was still only about 60% as good as the variable cap at its sweet spot. I tried the two previous variable caps, connected correctly, but got silence from both at every rotation point. This is a mystery to me. I connected the double-ganged variable cap again, correctly this time, and the results are good. There isn't a lot of audible difference between this and the 'split stator' arrangement, except that now the sweet spot is very close to the point where the cap is all the way open. About 4 mm of the rotor and stator are meshed when the antenna is tuned. Struggling to understand what's going on with the variable cap. More later on that. Meanwhile, for better stability, I epoxied a piece of coupling to the stand and reinforced it with fiberglass wallboard tape and more epoxy. Messy job, but it's not going to fall apart. Had to shorten the mast a bit afterwards. Restored the specified spiral loop wiring and tried out a higher value variable cap, purchased today at my first-ever hamfest here in Kansas City for a dollar. The antenna is working correctly now. Thanks to Steve Smith for the suggestion. In the picture, the new cap is on the right. 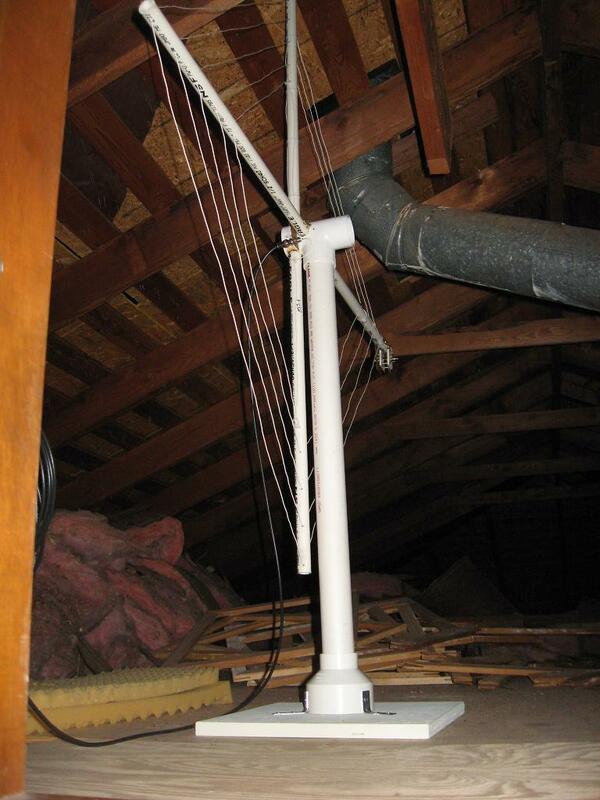 The spiral loop antenna is now installed in the attic, about 15 feet above ground level. I disconnected the banana plug end of the wire from the capacitor and soldered the wire to a solder lug on the BNC connector plate. That makes no sense to me, but it works much better. Performance is pathetic compared to the half-wave dipole at 20 feet, but for my purposes (learning to copy CW in my head as I drift to sleep), it's ok. 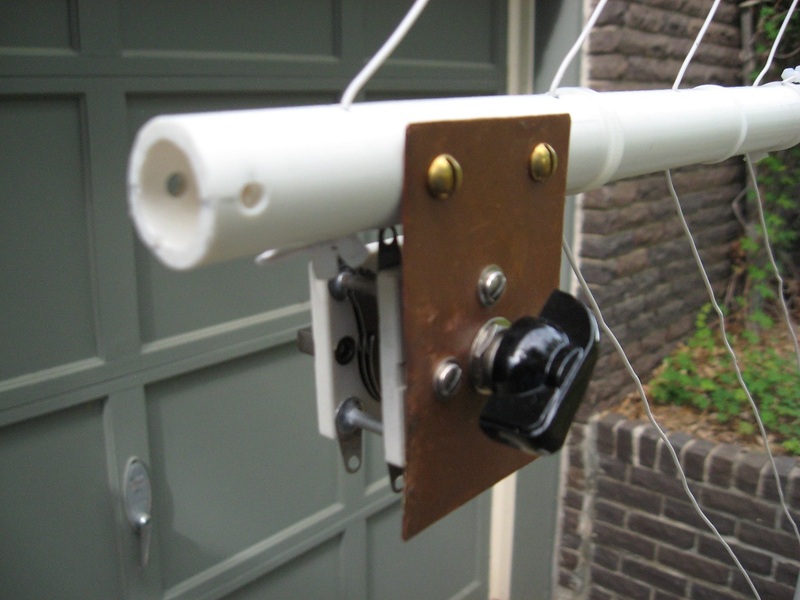 The project was worthwhile, if only because it reassures me that my dipole is a good antenna, although it's too low. 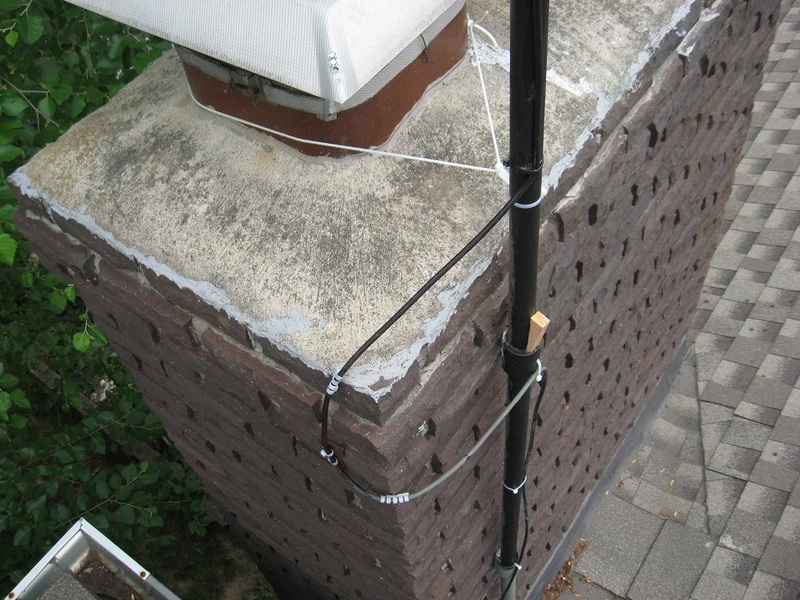 The spiral loop antenna needs help. After I installed the banana plug (to enable the assembly to fit through the attic door), I could barely hear anything. As of now, simply unplugging the banana plug and grounding it to the BNC connector plate actually improves performance. I'm going to try some drastic changes. I might have better luck with the house gutter, based on what I'm seeing now. Doesn't make much sense. I won't be transmitting with this antenna, so whatever works for reception is what I'll do. The spiral loop antenna is finished. 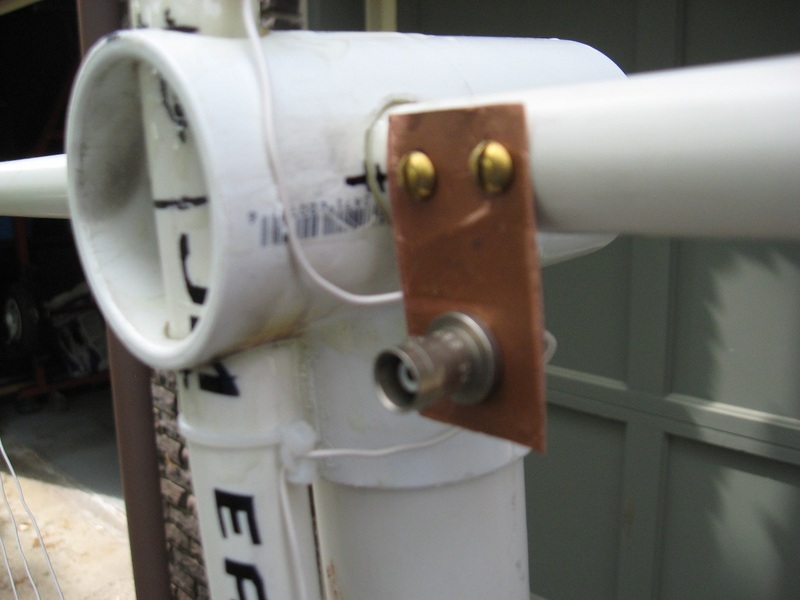 I mounted the variable cap and BNC connector to the horizontal crossbar with brass screws and pieces of copper plate. Lots of zip ties hold the wire on, and I've dabbed liquid tape here and there to strengthen some of the bends. I made a stand from a large coupler, plywood, and steel L-brackets. The antenna provides far less gain than my half-wave dipole, but still allows portable listening to 40 meters, which was my goal. More testing is needed, because the variable cap doesn't make any audible difference in the signal, and there's an odd thump when I turn the RF gain control. 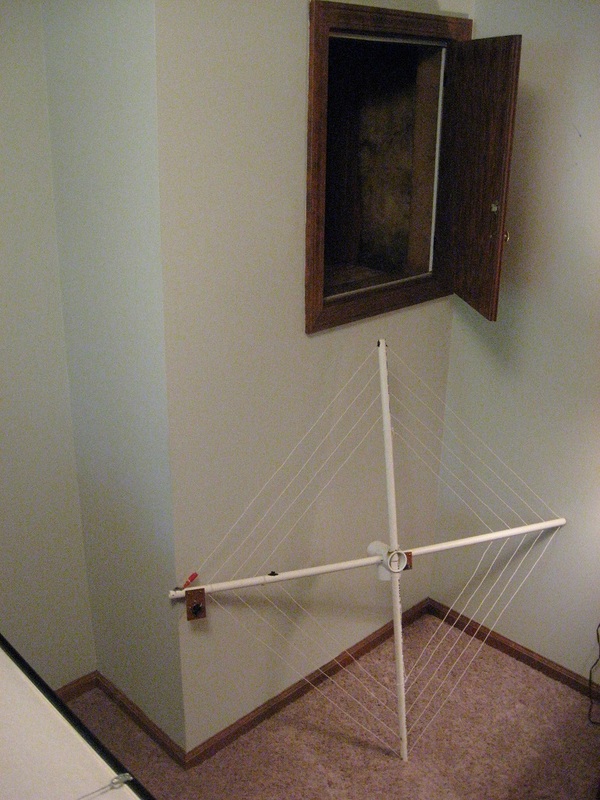 One of the biggest problems was figuring out how to get the antenna through an attic access door. I had to make one of the outer turns collapsible with a banana plug and jack. 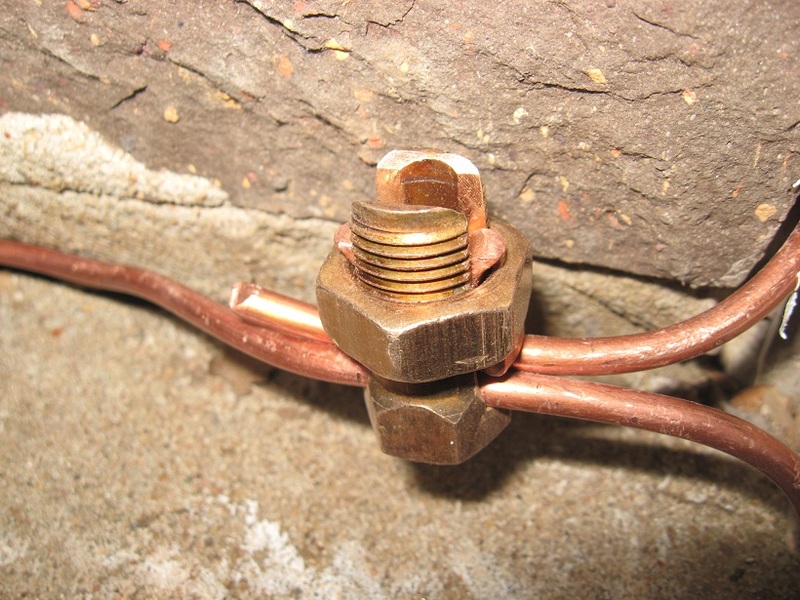 The jack is connected to the variable cap via a soldered connection on a piece of copper clad board screwed and epoxied to the crossbar. I also had to cut 3 of the crossbar ends off with a pipe cutter. It barely squeezes through. 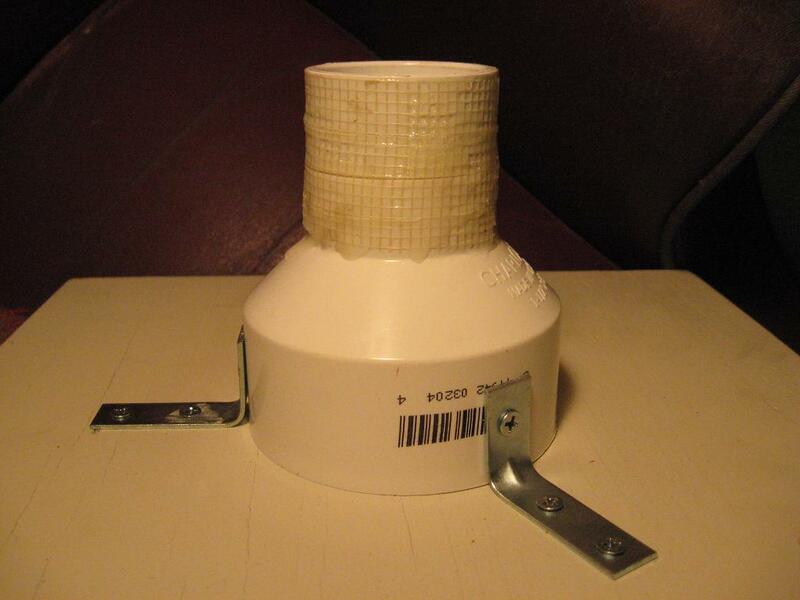 When installed, the antenna will be 5 feet high on its stand inside the attic. I made a cable from 30 feet of RG58/U with a BNC male connector on each end. 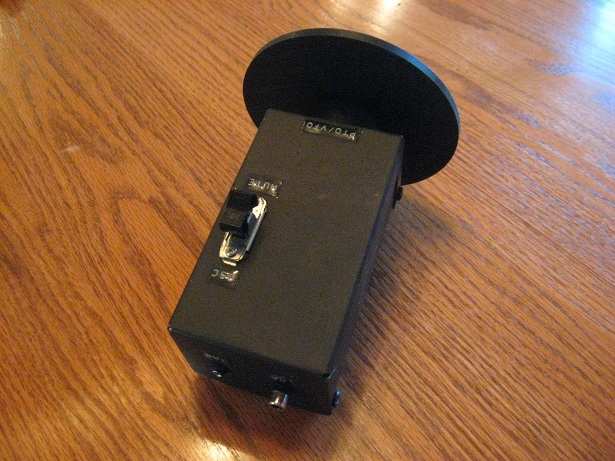 This will stay connected to the antenna and coiled up in the attic, to be pulled out and connected to TinEar for use. The photo of the whole antenna assembly is what it looks like as of 4-17-2012. TinEar is finished. 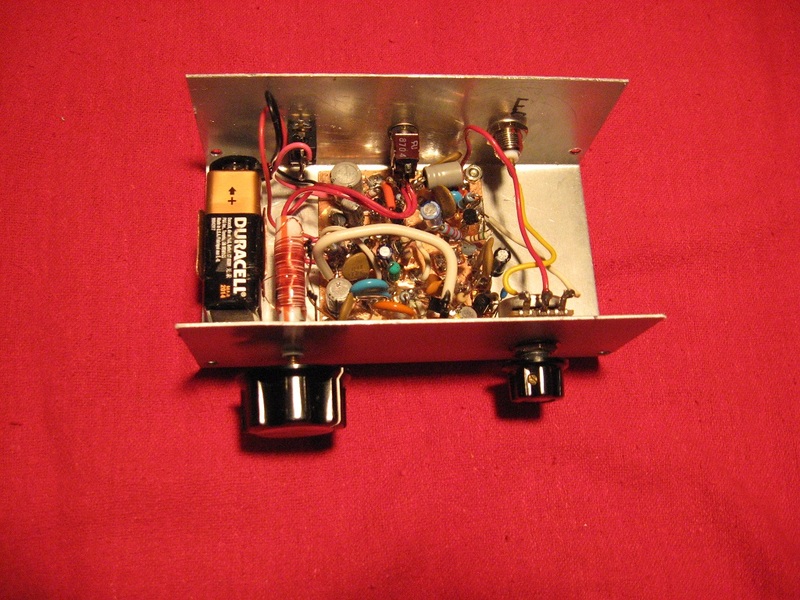 It doesn't cover the whole 40 meter band (probably due to the way I wound the coil) but it seems to cover all the CW, which is what I built it for. It sounds really good. It just took a little tweaking to eliminate one last pesky bit of hiss and squeal. The culprit was a small capacitor that was sticking up really high. I lowered it, and all was well. 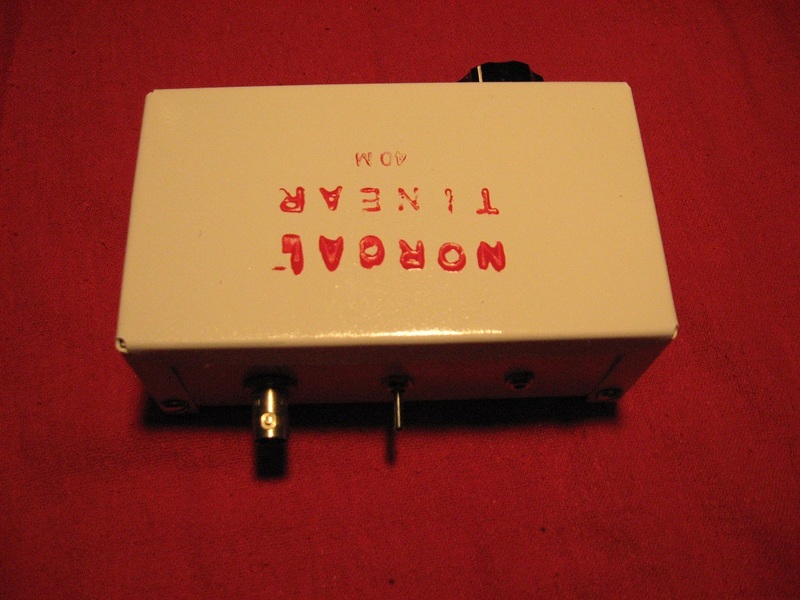 I labeled the enclosure with a set of rubber stamp block letters and red Testor's enamel after I sprayed it white. The paint doesn't stick very well, but it's the look I wanted. The more it peels, the better. Finally got TinEar working after cleaning the whole board with a toothpick and compressed air. It may have been working yesterday, but I was using a tiny speaker and I never heard any stations until I plugged it into the Hallicrafters speaker cabinet tonight. 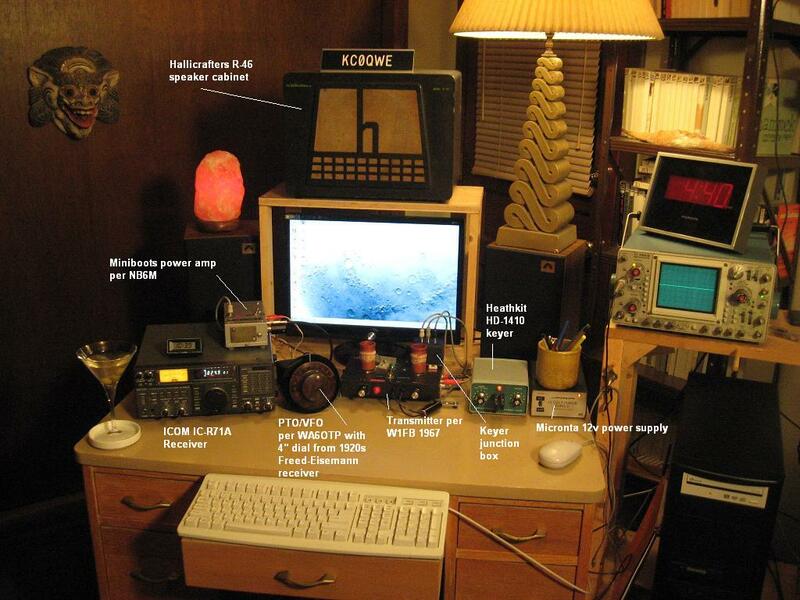 I began hearing broadcast stations on 40 meters, and some RTTY and a small amount of CW. 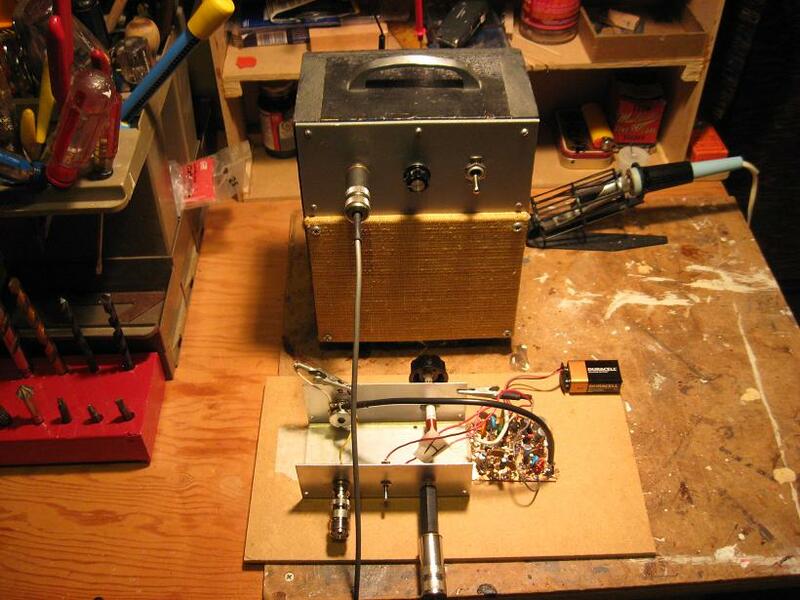 Got even better results using a homebrewed mini guitar amp to amplify the audio. I will need to redo the coil and leave the turns loose for adjustment, because it seems to only pick up the top end of the 40 meter band as it is. 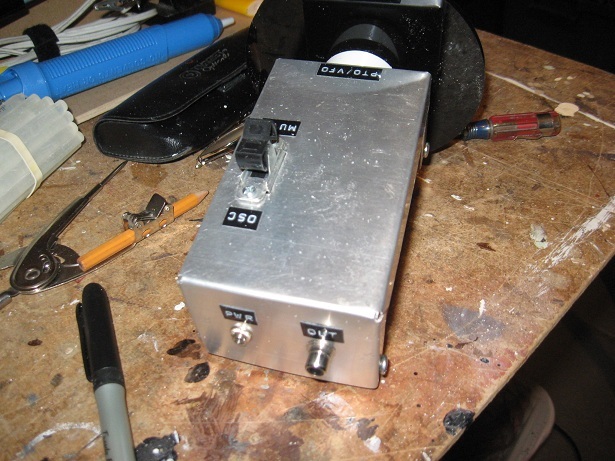 Now that I know the receiver will work, I'll begin putting together the parts for a compact antenna for it. 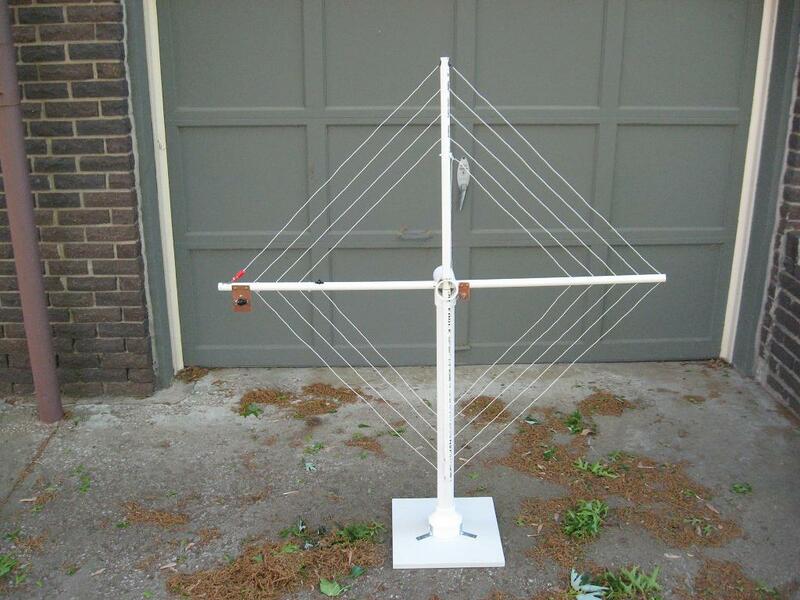 I plan to build the 40 meter version of the M0VPO 80 meter spiral loop antenna. I finished soldering the parts on the board for the TinEar receiver. It's the most complex project I've done without having access to a trace layout. I almost quit in the middle of it, thinking I couldn't do it Manhattan-style. It's solidly built, but sort of resembles Manhattan after an earthquake. 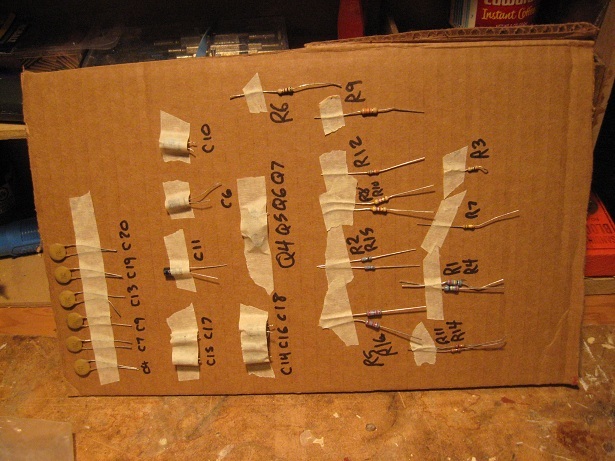 I started out using gold-plated tabs cut from a modem card for the super-glued solder pads. But they didn't stand up to soldering very well. Sometimes the plating popped off the pad, and sometimes the pad popped off the board. Some of them popped off the board after I got 4 or 5 leads soldered. I was out of regular epoxy, so I cemented those pads to the board with "Mighty Putty". Not the best solution. I might redo those. Halfway through, I pulled the unsoldered pads off the board with pliers and replaced them with tiny squares cut from copper clad board, which is my usual method. 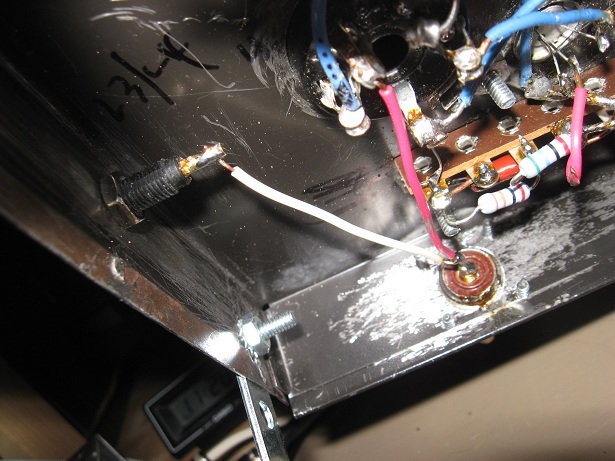 In the TinEar receiver manual, NB6M suggests that a particular drinking straw from "California Burger" be used for a coil form. Closeup color photos of this drinking straw are provided. I was wondering what to use instead, and then I found an identical straw still in its wrapper in a QuikTrip parking lot. Wound the coil per the very detailed instructions. Earlier, I found about half the parts for the receiver in my parts stash. Ordered the rest from Mouser Electronics today. 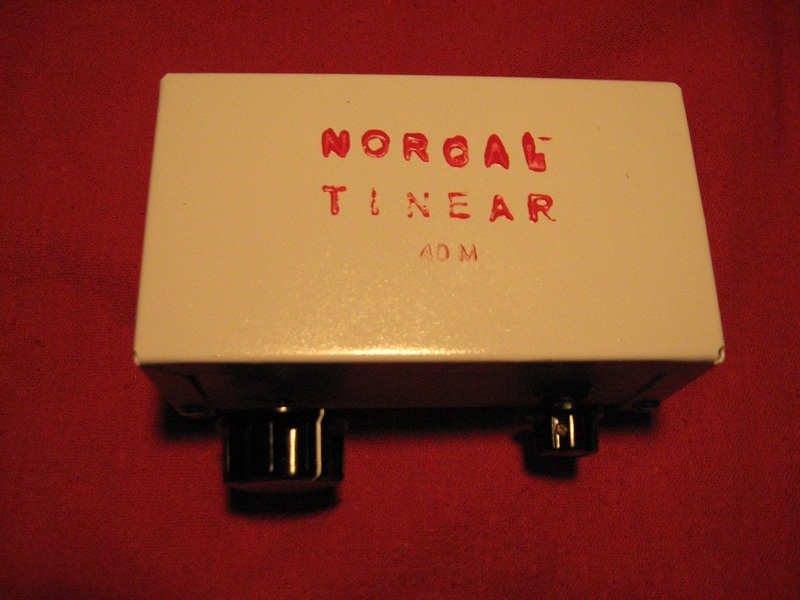 I want a small receiver for casual listening to 40 meters, and I found one that I hope to build: The NorCal TinEar. 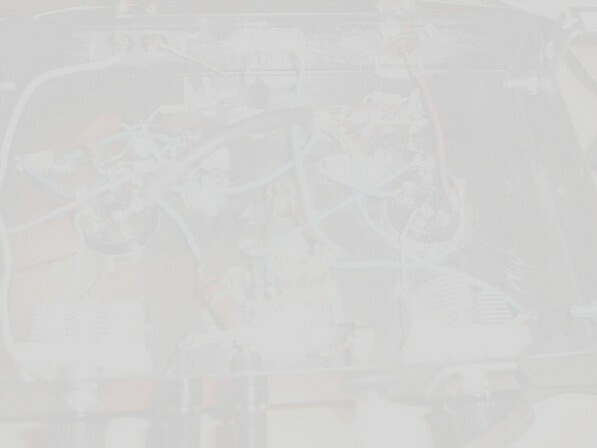 I found a detailed manual, parts list, and parts layout for it, but no trace layout. So I printed the parts layout and began drawing traces on it. I plan to etch a board for this, because it looks too complex for Manhattan-style construction. My progress with re-learning the code at 20 wpm is steady, but frustratingly slow. 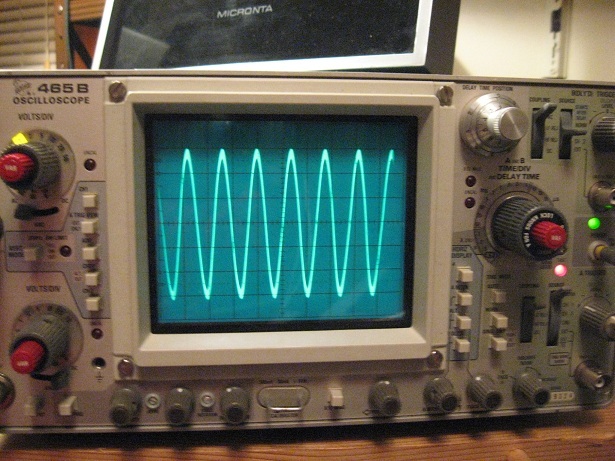 Meanwhile, I measured the transmitter-only voltage and frequency with the scope. I have the scope set to .1uS/div. There are 1.4 divisions per cycle. The measured frequency therefore is roughly the same as when measuring Miniboots' output. Close enough. I am relying on the receiver's audio output and digital display for determining my transmitted frequency. Voltage: 3.9 divisions p/p; scope is set to 5 volts per division, therefore 19.5 volts p/p. Vrms = 6.9 volts....and that matches what I've measured before. 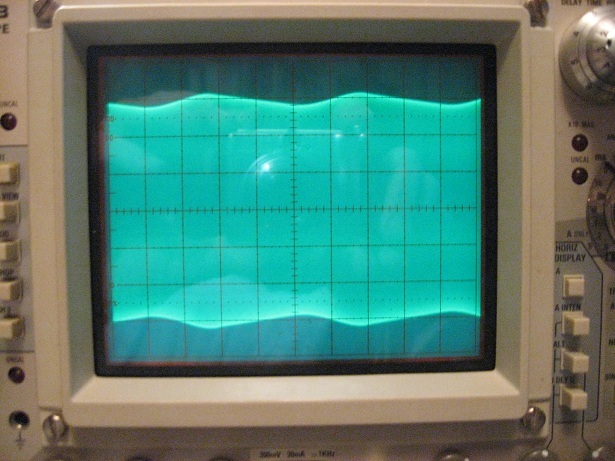 The transmitter's output produces a distorted waveform (photo #1 below), but after that output is amplified and filtered by Miniboots, the waveform is cleaner (photo #2 below). So the lowpass filter in Miniboots is probably correcting the problem. The only thing left to do for now was to fix the slight tendency of the PTO/VFO shaft to sag due to the weight of the big dial. I made a tiny "table" from 3 pieces of 1/8" plexiglass, superglued together. 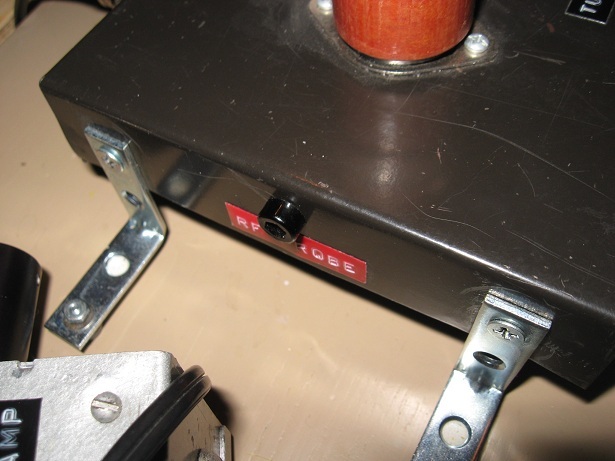 The legs of the "table" allow room for the shaft coupler to clear. I secured this "table" to the surface of the faceplate with black silicone gasket sealant. The "table" edge is touching the shaft. The shaft rides on top of the "table" edge, and won't sag anymore. 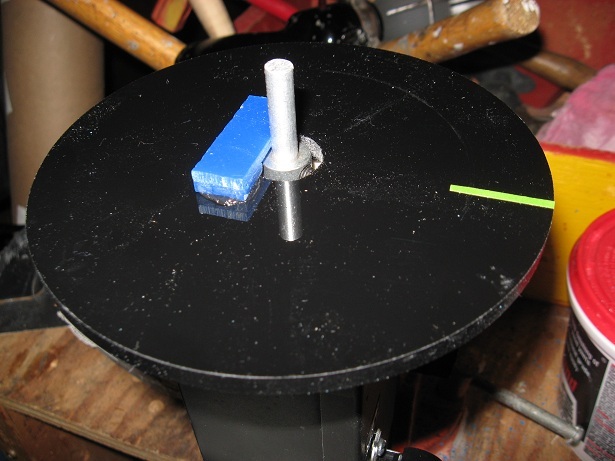 I also attached a pair of 1/8" plexiglass cubes (not shown) to the "table" at each side of the shaft to prevent horizontal movement. 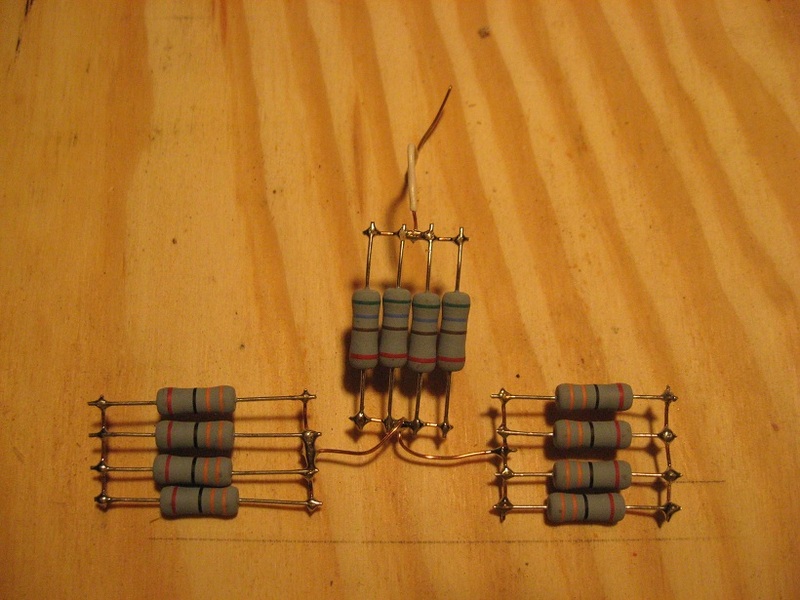 For a whopping $7.95, I bought five 7410 Triple 3-Input NAND Gate ICs to have on hand for the keyer, in case the current one gets blown (or is blown). I'm going to tinker with the keyer a bit. 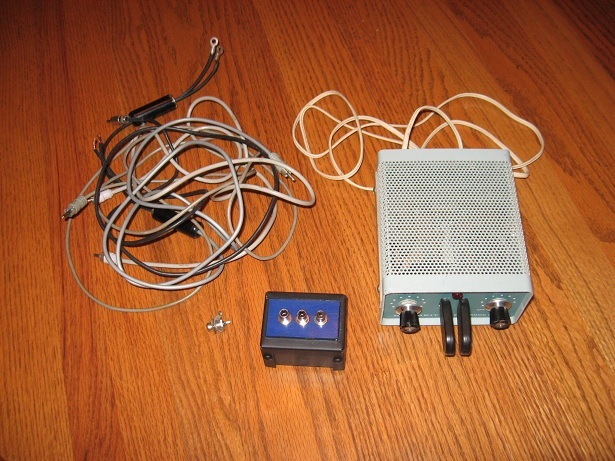 Here are photos of the Heathkit HD-1410 Electronic Keyer, the junction box, and partially built cables for connecting the keyer to my rig. After trying out the keyer and hooking everything up, I realized that these cables are going to have to be shortened drastically. I don't want a rat's nest. Also, the straight key initiates a "hold" when I plug it into EXT KEY and key it. This "hold" goes away when I press either paddle. That wasn't a deal breaker for me. Although it's a bit primitive, I like the keyer so much that I probably won't even use the straight key again anyway. 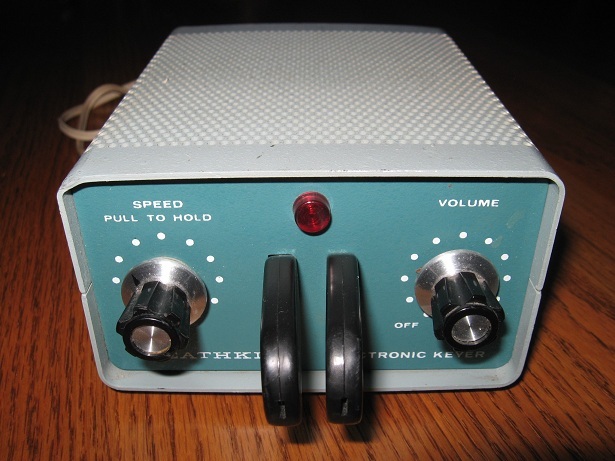 Yesterday I won a mid-70s Heathkit HD-1410 Electronic Keyer on eBay for a little over $60 shipped. I was in the market for a keyer and a paddle, and this unit has both. I like the design, at least visually, and there are a lot of happy users out there. Got the manual for nothing online. I spent some time this evening building cables and a junction box to connect the keyer to my rig. 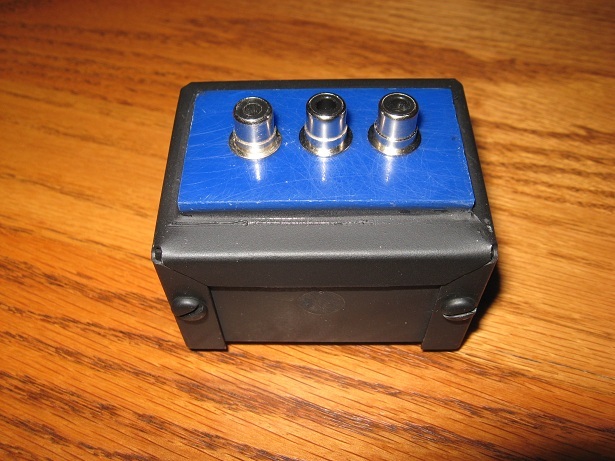 It will be keying the transmitter and Miniboots, so I'm building a junction unit with 3 RCA jacks in parallel, insulated from the aluminum project box which is about the smallest I've ever seen. Heathkit says to use shielded cable, so I raided my bushel of cable leftovers and found just the right stuff. I'll still be able to use my straight key via a jack labeled "EXT KEY" on the back of the keyer. 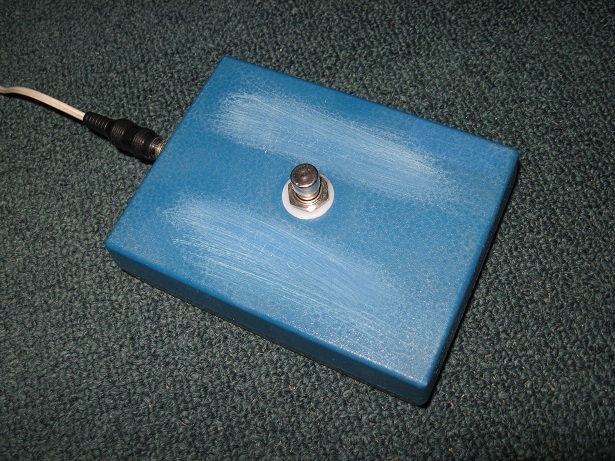 Made a foot switch box to replace the huge awkward guitar switch pedal that I used to use for zero-beating. The new box is low to the ground and is made of heavy plastic. I put 2 patches of velcro hooks on the bottom to make it stay put on the carpet. The switch feeds 12 volts to a relay inside Miniboots which simultaneously keys the transmitter and switches Miniboots to a dummy load. I studied a Paul Harden article that Steve Smith sent me, something clicked, and I finally did the math: I have the scope set to .1 uS/div. There are 1.3 divisions per cycle. I've been measuring my transmitter's output with the VFO ranging from about 7.025 - 7.125 MHz...but I may have misread the zero-crossing points when I measured 1.3 divisions per cycle. 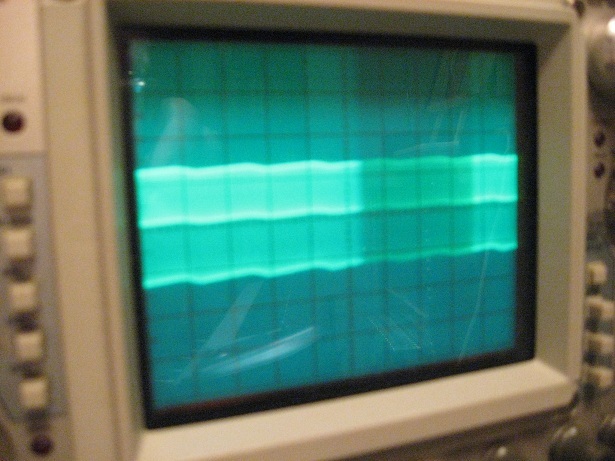 My main issue was: I didn't get why the sine wave doesn't visually expand and contract when I change the frequency. Steve confirmed that the amount of change is so relatively small that I can't see it. Calibrated the PTO/VFO using the big dial. 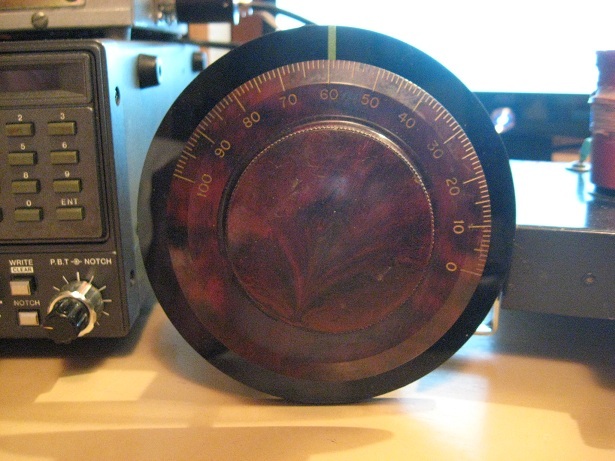 One turn of the dial covers about 20 kHz. 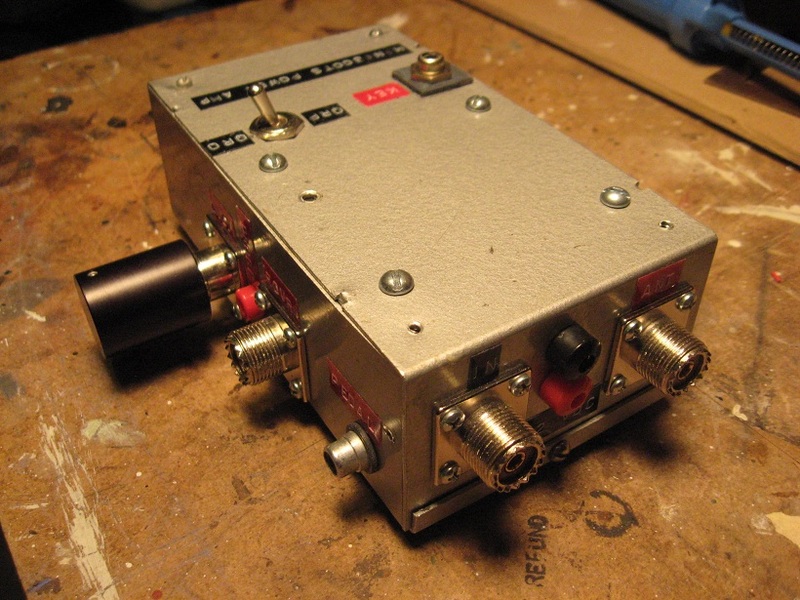 The usable 40 meters range (for me) is 7025 - 7237 kHz with this device. The General license lower limit for 40 Meters CW is currently 7025 kHz. At that frequency, the dial's base is out 3/4" from the faceplate, but still feels solid enough and stays put. 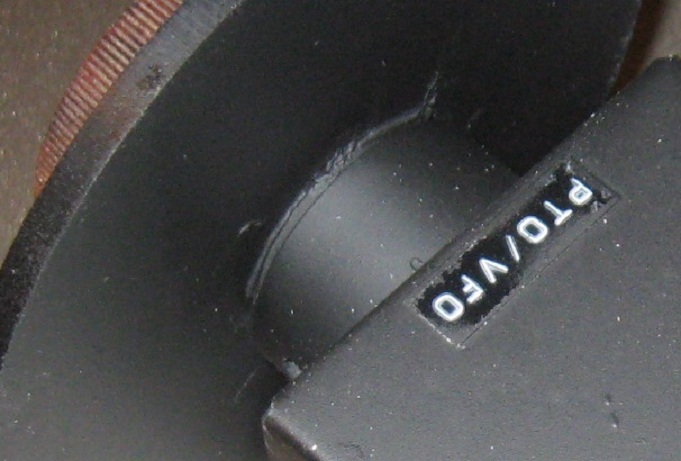 At 7237 kHz, the tuning screw is all the way into the device, and the dial's base is nearly flush with the faceplate. I marked the faceplate with a sliver of Frog Tape and made myself a chart showing the frequency per full turn. Blacked out my websites for a day to protest SOPA/PIPA. 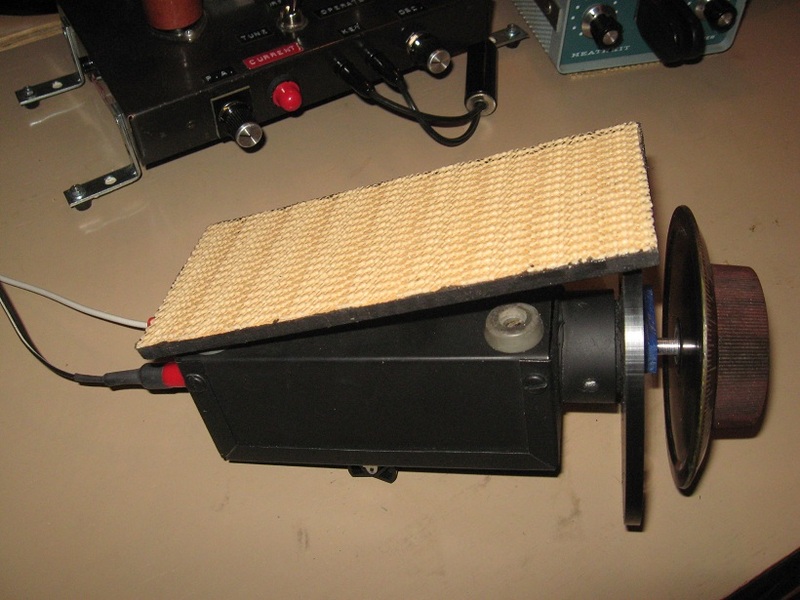 Modifying PTO/VFO to use a 4" antique bakelite knob on a 5" black plexiglass faceplate. 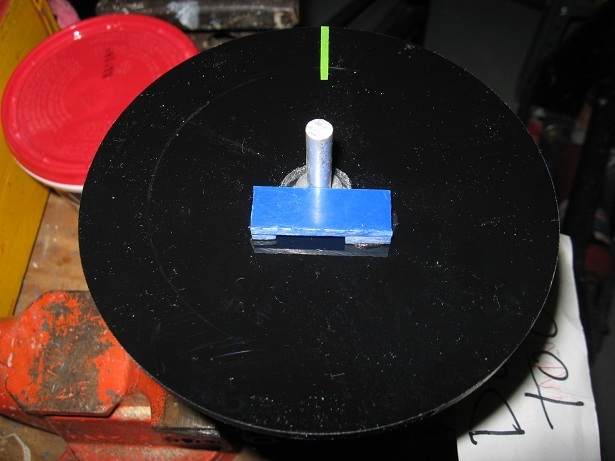 The assembly is attached to the PTO/VFO with a combination of parts: A control shaft coupler, an extension shaft, a sawed-off PVC coupler, a short pipe to friction fit inside the coupler, a plexiglass disc, and the big knob itself. As the project becomes more photogenic, I'll provide photos. Finally connected the scope to Miniboots' test jack. Transmitter is using a 7125 kHz crystal. The results weren't what I expected. I struggled to get the display to stay still. I had the probe set to 1x. Finally, I achieved...something. Obviously, I don't know what I'm doing yet. And I couldn't get the display back to any sort of default setting until the next day, when I restored the scope settings while measuring a 9v battery. I think that article has what I need. I was all set to replace Q2 in the transmitter when I decided to do a few tests just to make sure. Amazed to find that when I remove my standalone lowpass filter, the transmitter output measures 7 volts, which works out to just over 1W; slightly better than my goal. Then, with the standalone lowpass filter still out of the picture, I measured Miniboots' output at 19 volts, which works out to 7.4 watts. These values match up with what my notes from 2004 tell me is normal, and with what I remember. I also see many references to "remove LPF" in those notes. So now I think that the lowpass filter built into Miniboots has sufficed and will suffice, and I can leave out the standalone lowpass filter. 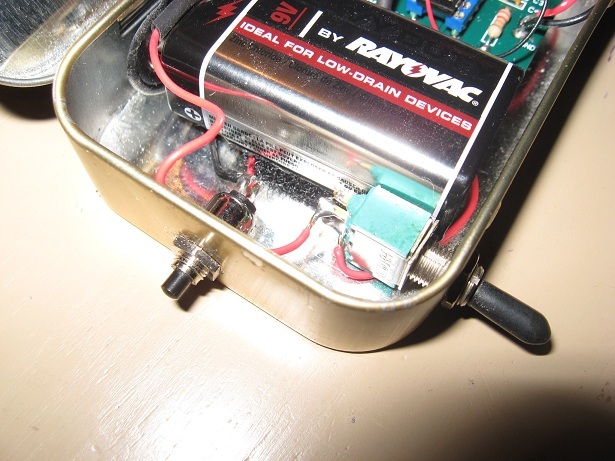 Also, when I first began reconstruction, I saw that the standalone lowpass filter has a "bypass" alligator clip and wire attached inside the enclosure; more evidence of previous experimentation with leaving it out (fortunately I left myself a note about it stuck on the enclosure). So now I think I'm good to go. My CW retraining is going slowly but surely. I'm up to just over half of the 40 characters I'm shooting for at 20 wpm, way beyond what my speed was in 2004. Reviewed the detailed log of my transmitter tests from 2004, when I was racking my brain (and the brains of others) trying to make it work. One of the entries shows a reading of 4 volts (too low, just like right now), which I had fixed by replacing Q2 (an NTE 128). I have some spares, so it's open heart surgery time. I may have blown Q2 the other day when I blew the breaker on the power supply by getting careless with the wires. 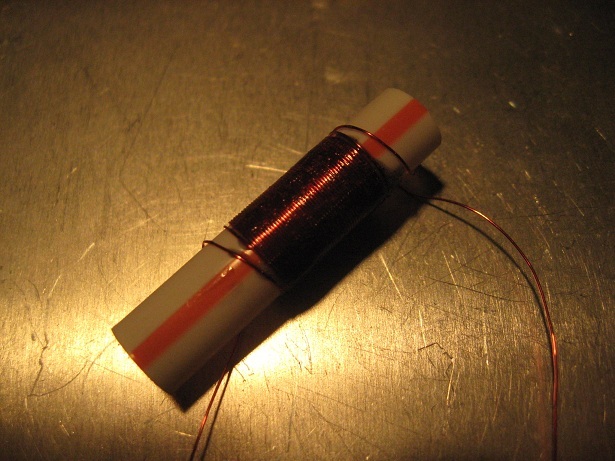 My goal is to get a measurement of 6.9 volts, which works out to 1.02W. I tested all my NTE 128s tonight, after making a transistor test holder out of scrap wood, a transistor socket, and some heavy wire. They all tested good, which is hard to believe, because many of them have solder on them, which means they've been installed and then replaced. Measured the output of the transmitter with an RF probe. Only 4 volts, which works out to .36W. Not enough, but at least it's stable this time. Troubleshooting continues. I received and installed the dummy load, but the transmitter's RF lamp wouldn't illuminate when tuning while the dummy load was switched in. Troubleshooting time. 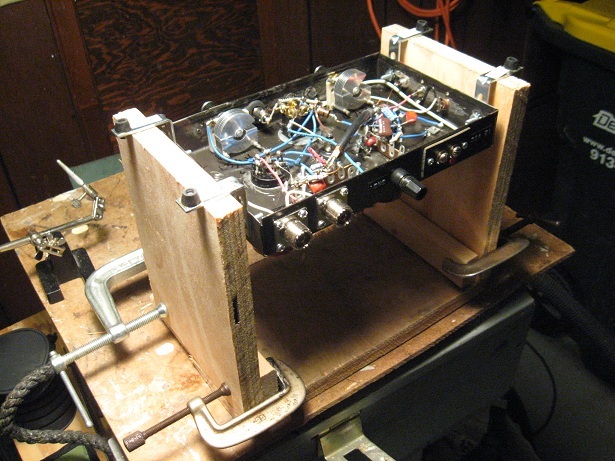 Meanwhile, to make it easier to work on the transmitter, I built a cradle out of 3/4" plywood and 1x2s. This holds it upside down while protecting the exposed coil forms, crystal, and transistor/heat sink assembly. In the photo, the cradle has just been glued, nailed, and clamped. Later, the RF lamp problem went away. Not sure why. 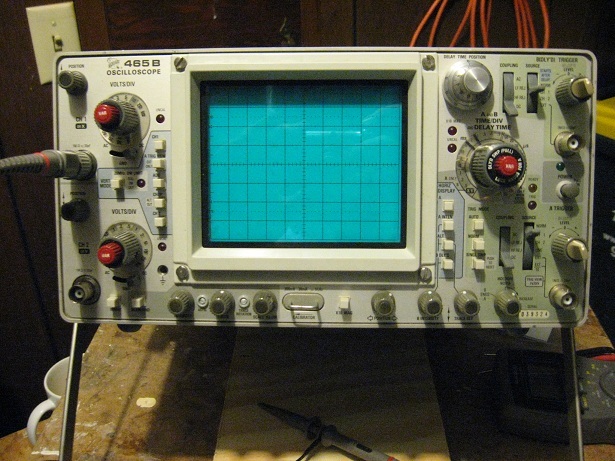 Yesterday I received a Tektronix 465B oscilloscope from Bob Garcia KD4JRT, "The Scope Man". Downloaded the 465 operators manual. 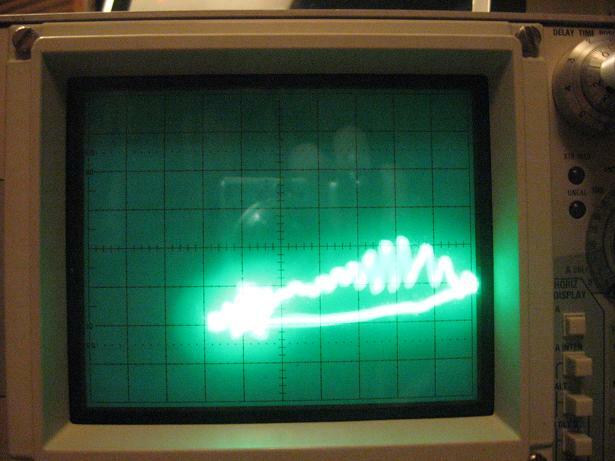 This is my first oscilloscope, and I'm feeling my way around it. Wired the antenna / dummy load switch on the transmitter. Recently found a way to keep Dymo embossed labels (I love 'em) in place forever: Super Glue! 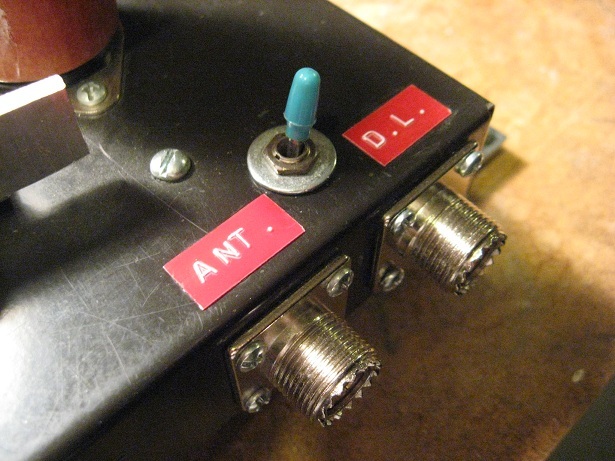 Put a PL-259 connector and a switch on the transmitter. Every time I drill this chassis, I regret using steel. The drilling took so long that I didn't have time to do the wiring. 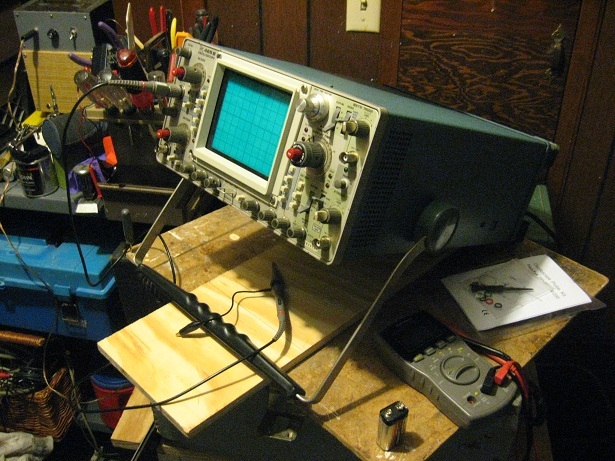 Made room for a Tektronix 465B oscilloscope that's on its way. 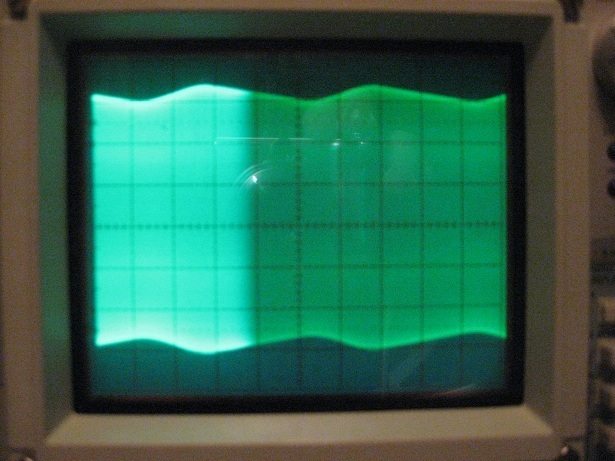 The receiver shows 7122.8 kHz for the 7125 kHz crystal when zero-beaten, vs. 7123.5 kHz reported by the Stinger Singer. I don't trust any calibration based on the crystal in the transmitter until I can key it directly into its own 5W dummy load, which I bought on eBay and is on the way. 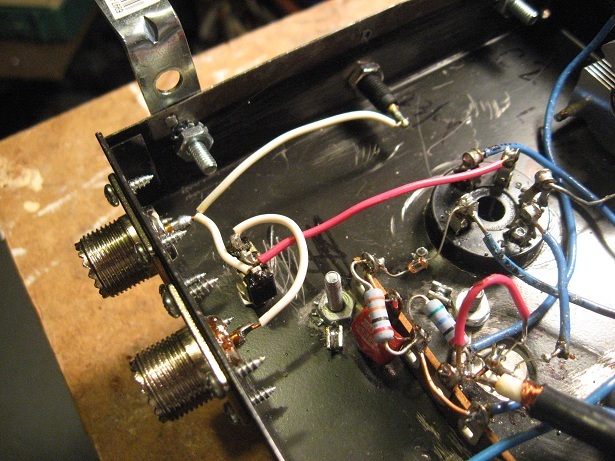 It will have its own PL-259 connector and switch on the transmitter. Miniboots' dummy load takes a different connector. Brief scare when my receiver's S meter looked dead....until a YouTube video made me remember that when AGC is off, so is the meter. Steve S. suggested I calibrate the Stinger Singer based on the oscillation of its own 4 kHz crystal when detected by the receiver. At 3.999.2 on the dial, the behavior was exactly as he said. I tweaked the Stinger Singer trimmer until it (evidently) zeroed. Tried the recommended 5 pf cap instead of a 4 pf, but the Stinger Singer report was a little farther off the 7125 kHz crystal frequency than the reading using the 4 pf cap, so I am going ahead with the 4 pf cap. 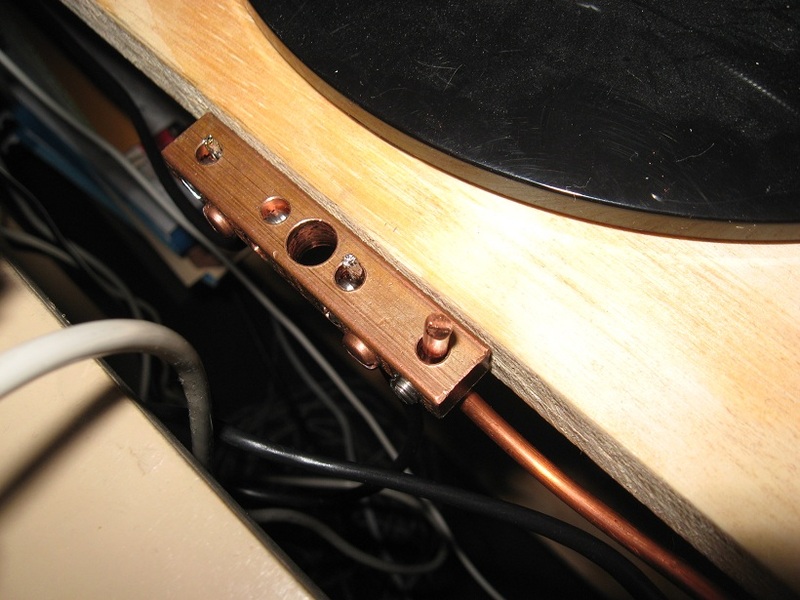 Installed an RCA jack on the transmitter for the frequency counter with the 4 pf cap coupled (using a super-glued copper clad board pad, ugly-style, inside the transmitter chassis), and a pin jack on the transmitter for RF output measurements. A measurement of the transmitter output, via my RF probe connected to the pin jack, was 13 volts. Works out to 3.5W. That's double what I've measured in the past, and I don't understand it. Up early to test Stinger Singer. Had to resolder the black lead to the piezo element. One of Steve Smith's suggestions (connect Stinger Singer via 4 pf coupling cap to top of transmitter L1) resulted in a reading less than 1 kHz below 7125 kHz (the crystal's value). I am using my camera to record a sound memo of the Stinger Singer's report, so I can play it back instead of remeasuring repeatedly, because I'm relearning code and I don't trust my ability to copy a long string of numbers yet and I don't want to keep keying the transmitter over and over. I began calibrating the Stinger Singer; a tiny turn of the variable cap brought the reported frequency closer to the crystal's value. In the evening I installed a tiny but rugged power switch on the Stinger Singer (harvested from the carcass of what appears to have been an expensive radar detector, or maybe even a police radar). I think it's a must-do enhancement to the device. 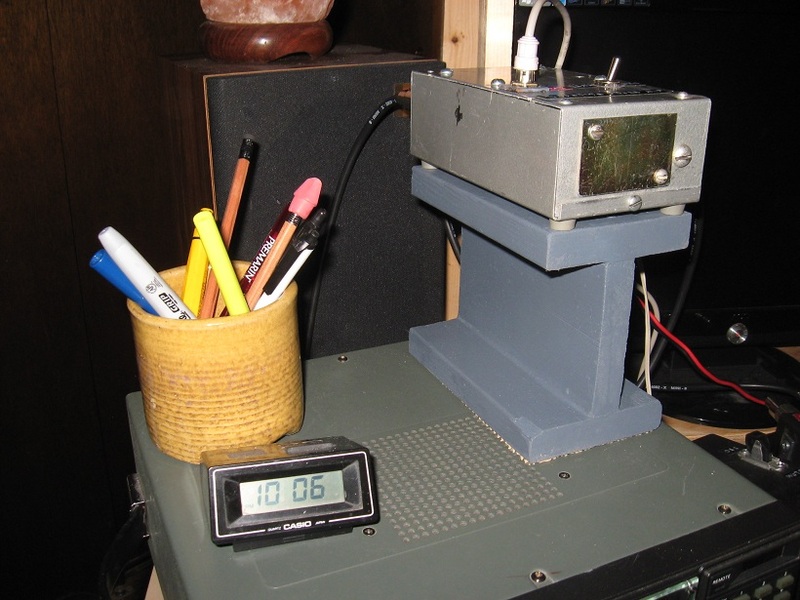 Steve has given me a method for calibrating via WWV and my receiver. Will be trying it. 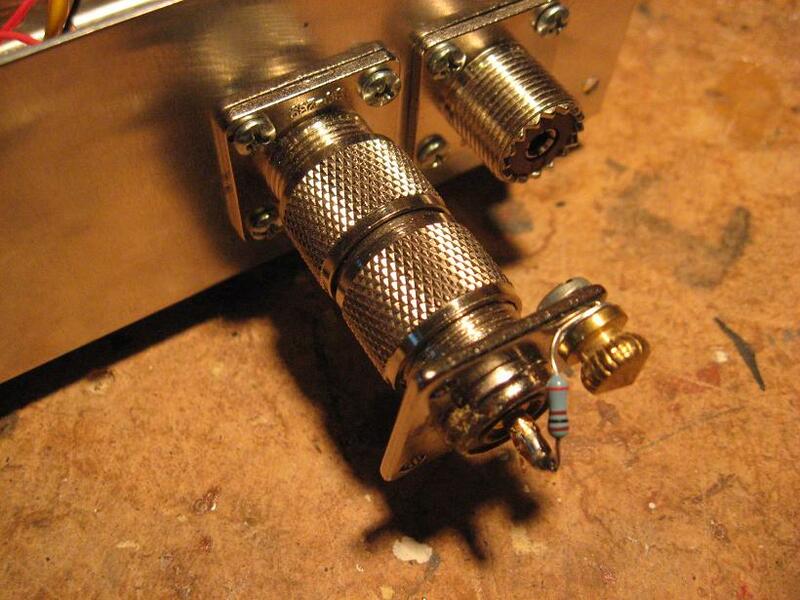 Meanwhile, I'd like to build a hinged cradle for the transmitter so I can turn it upside down easily. I seem to be doing that a lot lately. After spending the day fixing a bathroom drain, I resoldered the Stinger Singer's sound element. The battery had drained since I used it last, so if I keep using it, I'll need a battery cutoff switch. With a new battery, I couldn't get it to report anything less than 35 MHz, whether I used a 7125 kHz crystal or the PTO/VFO at around the same frequency. 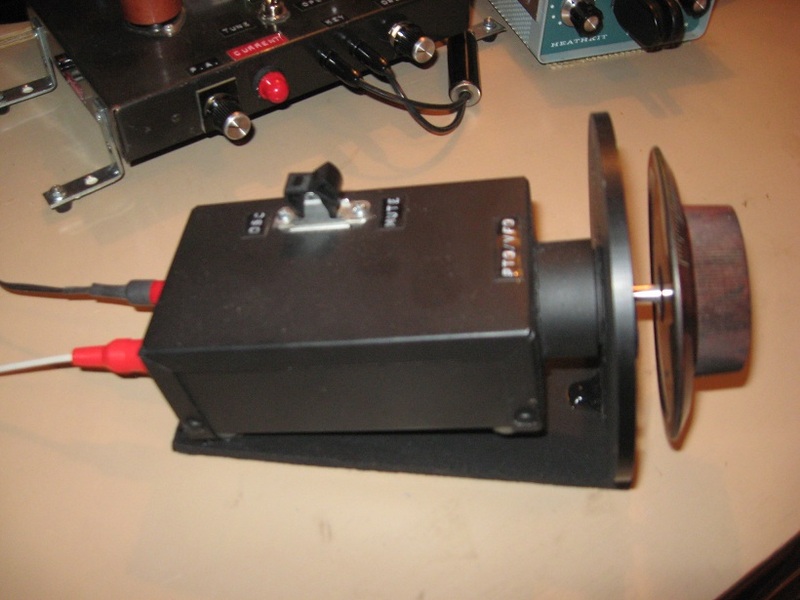 I can spin the PTO/VFO knob and find the frequency (always somewhere in the 40 meter band) on the receiver when I key the transmitter into a dummy load. I might not be connecting the Stinger Singer correctly. And I think the Miniboots is malfunctioning because I'm getting less than 7 volts on the meter via my RF probe, and it used to be much more than that. Using the new coax cable for the PTO/VFO. Can't hear or see any difference between its performance and the performance of the audio cable I was using. Called it quits and practiced code with G4FON's training application. I'm training at 20 wpm, but I'm only up to 16 characters. 7 years have gone by since I last knew all 40 characters provided by the application, and that was at around 10 wpm. Steve Smith had two suggestions regarding connecting the Stinger Singer. Built two cables from thin coax and RCA plugs. Verified that the Miniboots test pin jack is connected to the output, which (based on my test the other day) means that the output isn't what it should be. That will need to be addressed. 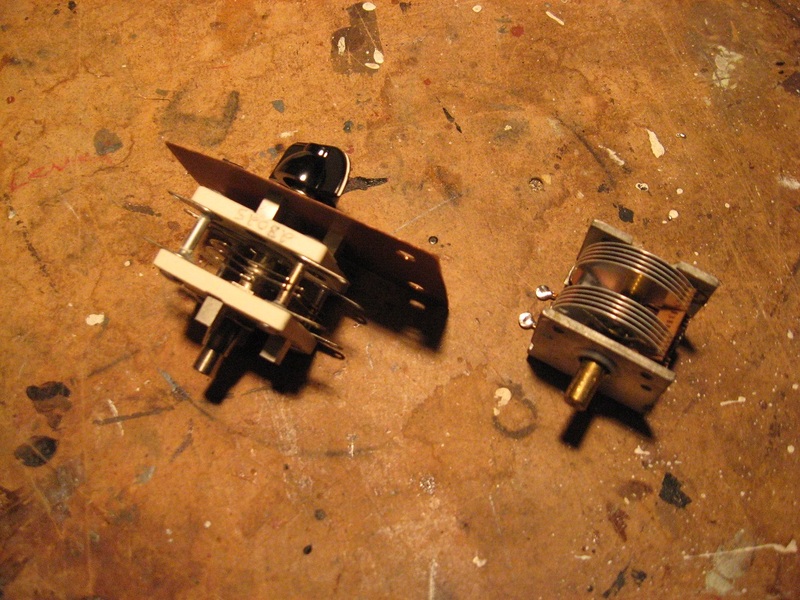 Meanwhile I hooked the Stinger Singer to the transmitter's Q1 base via a temporary coupling cap (4 pf) to try to calibrate it with a crystal plugged into the transmitter. I keyed the transmitter into a dummy load, heard a nice tone at 7125 kHz on the receiver, but the Stinger Singer had nothing to say....because the skinny little red wire to the piezo element had come loose. Didn't have time to fix it. It was way past my bedtime. Built the Stinger Singer. Had to add longer wires than were provided. There was a third unexplained blue lead from the sound element that I shrink-tubed and tucked away under the lid. Used velcro instead of double sided tape to attach the board to the Altoids tin. Expected it to be piercingly loud, but it isn't. Still haven't tried it with the PTO/VFO, but it does cycle through its modes as explained in the instructions, and it reports a frequency (a high one) that it's producing itself somehow. That frequency varies each time the button is pressed, and that's probably because there's no input yet. My retinas cannot take the sight of a bare filament, even a tiny one. So I cemented green and red plastic dome covers over the transmitter lamps with a bead of black silicone (red for current, green for RF). They're from the 12v lamps I originally bought for the transmitter, but which for some reason never worked. Labelled all controls and connectors on the transmitter. Found a 5 pf ceramic cap on an old stereo's circuit board, which I will use as coupling capacitor after I build the Stinger Singer. 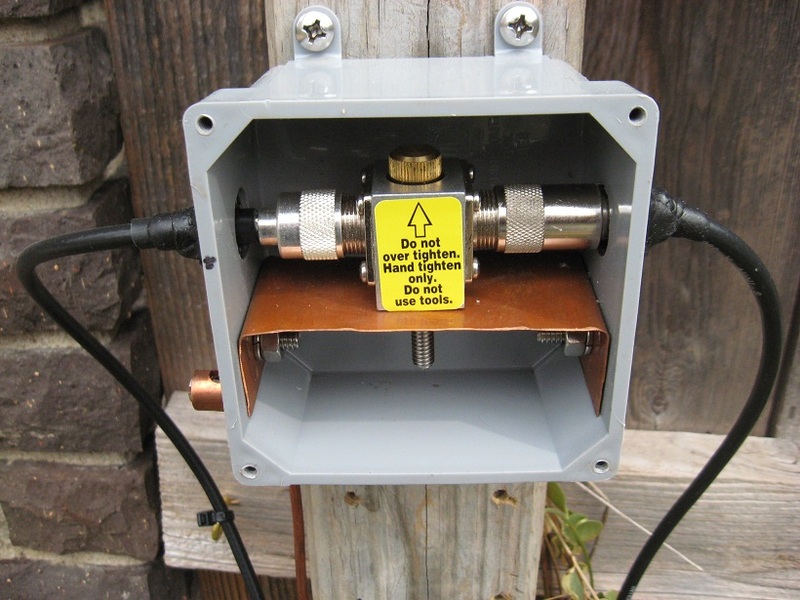 Jim McNutt WA6OTP, from whom I purchased the PTO/VFO kit, said that he's had good luck using RG-174 coax with the PTO/VFO. I've been using audio cable since day 1 with this device...and currently wondering why. I will be using the Stinger Singer for VFO measurement, so a 5pf coupling capacitor should be connected in series with the Stinger Singer's input. 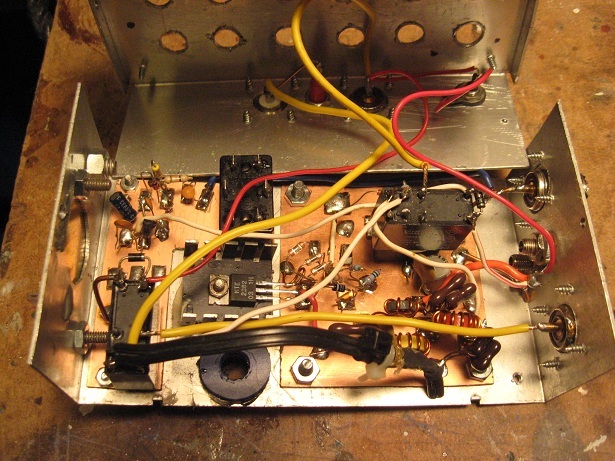 Tested 7125 kHz crystal in transmitter with PTO/VFO disconnected and receiver tuned to the crystal's frequency. When I keyed the transmitter into a dummy load, the tone was good on the reciever at 7125 kHz. Output measured via RF probe at Miniboots test pin jack was approximately 7 volts at first, but slowly dwindled. I expected a higher measurement than this from the Miniboots output, but I need to verify that the pin jack is in fact connected to the Miniboots output. 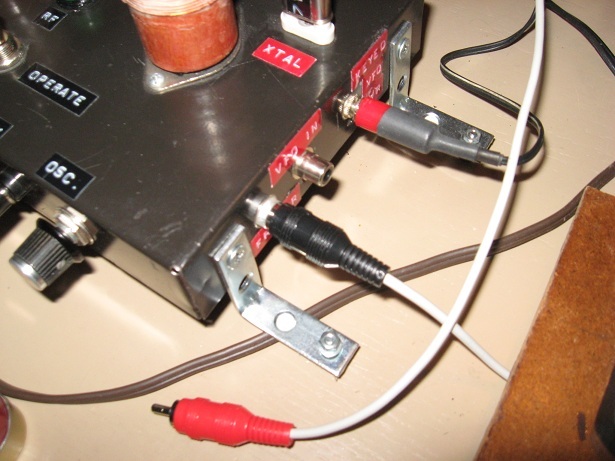 Later, I was able to make the PTO/VFO produce an audible and knob-variable tone on the receiver at about the same frequency when I reconnected the PTO/VFO and keyed the transmitter into a dummy load. 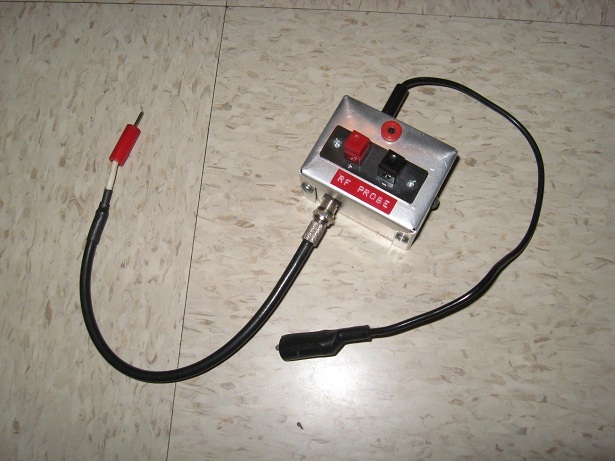 If the pin jack is connected to the Minboots input, the voltage reading makes sense when plugged into a formula provided in N5ESE's "Classic RF Probe" article: ((7 volts +.25) * (7 volts + .25)) / 50 ohms = 1.05W. Expected from transmitter, but much less than expected from Miniboots. First real test of rig since its failure in 2004. With the PTO/VFO connected, I keyed the transmitter into a dummy load and measured Miniboots output with rf probe into meter. Meter reading was approximately 7 volts, and it varies from second to second. Found Stinger Singer frequency counter kit, unbuilt, that I purchased in 2004. Steve Smith WB6TNL told me that there's nothing wrong with using RCA connectors.